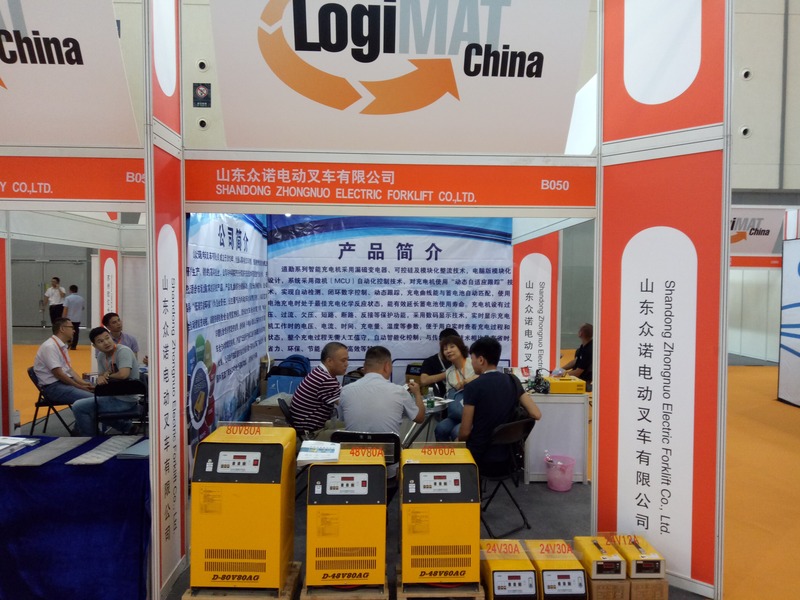 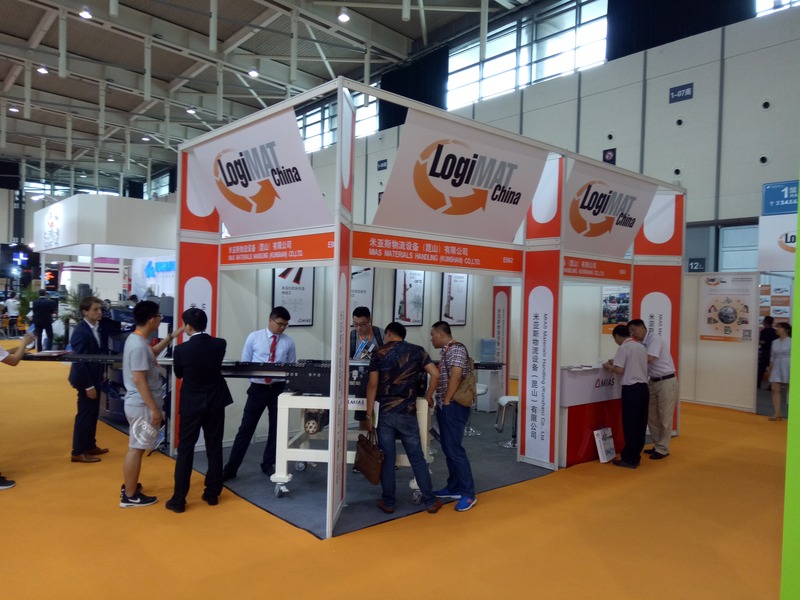 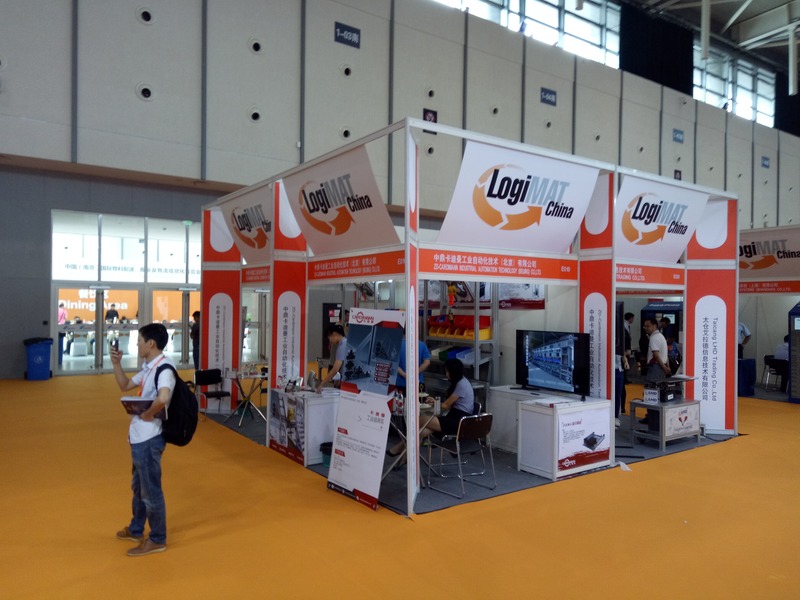 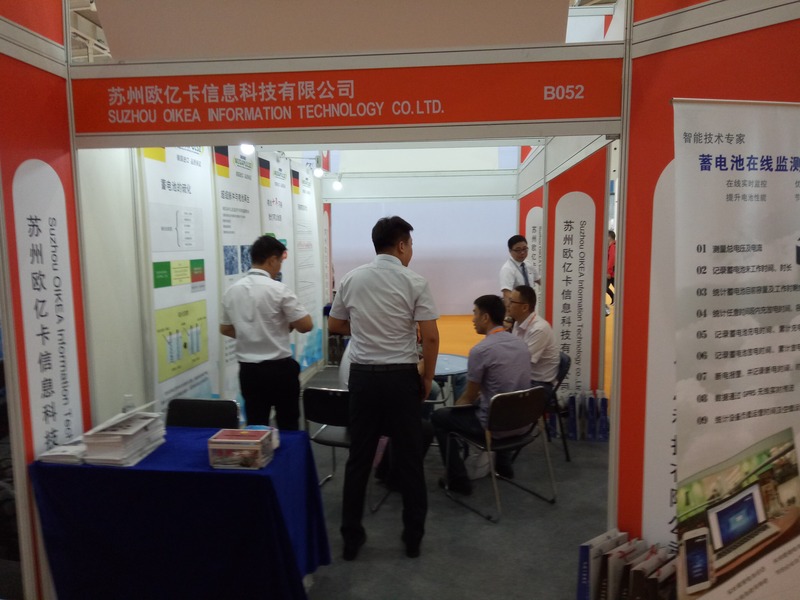 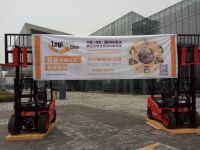 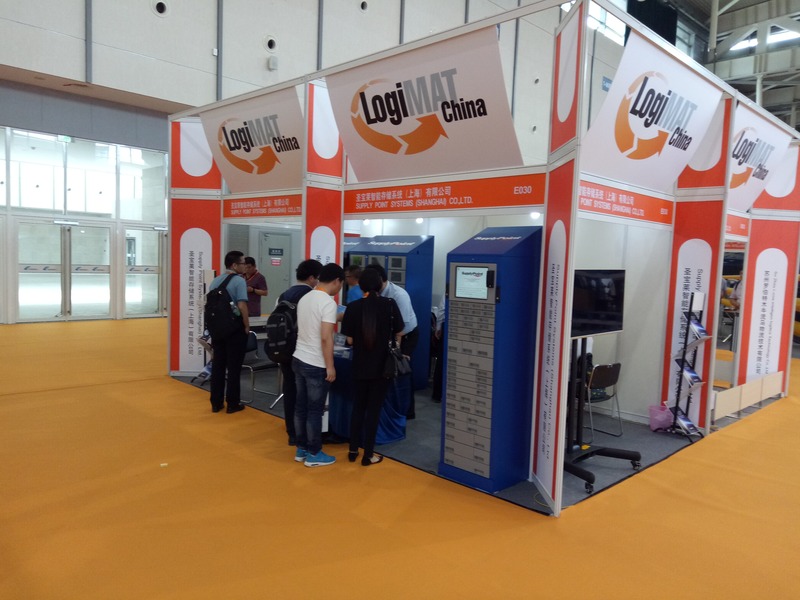 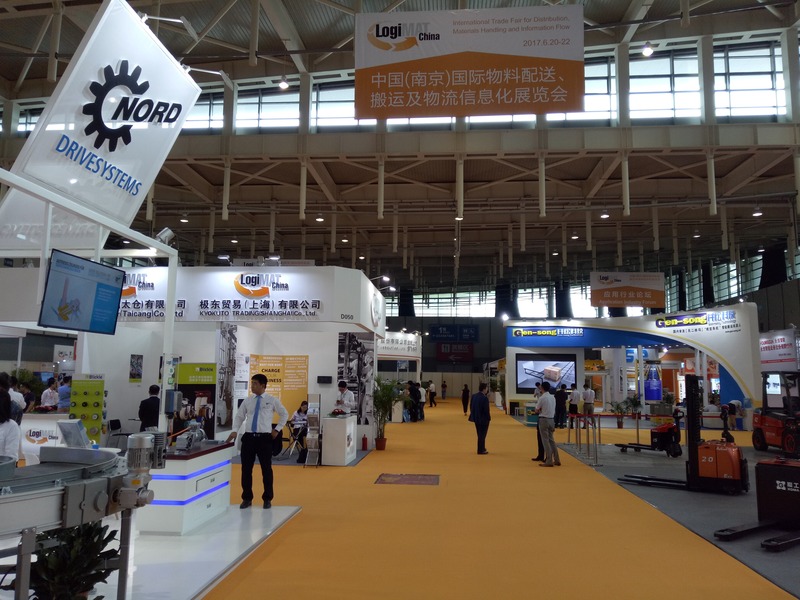 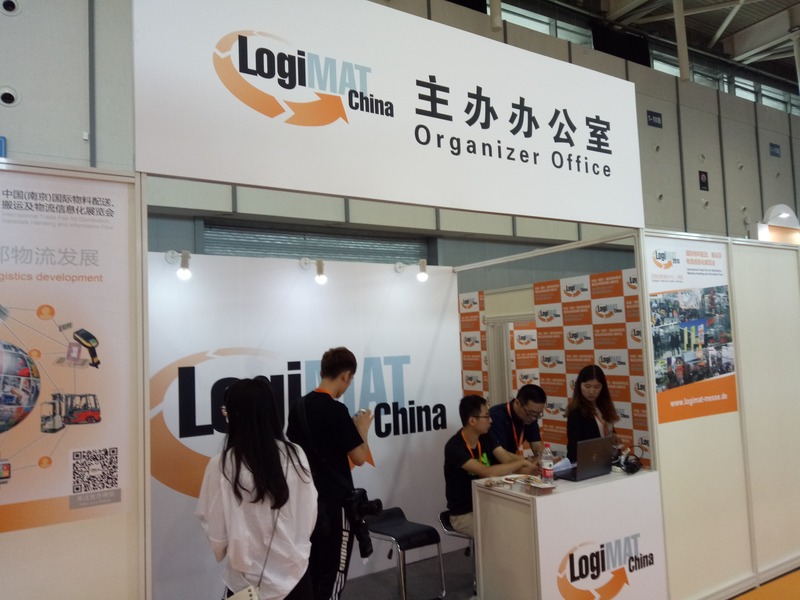 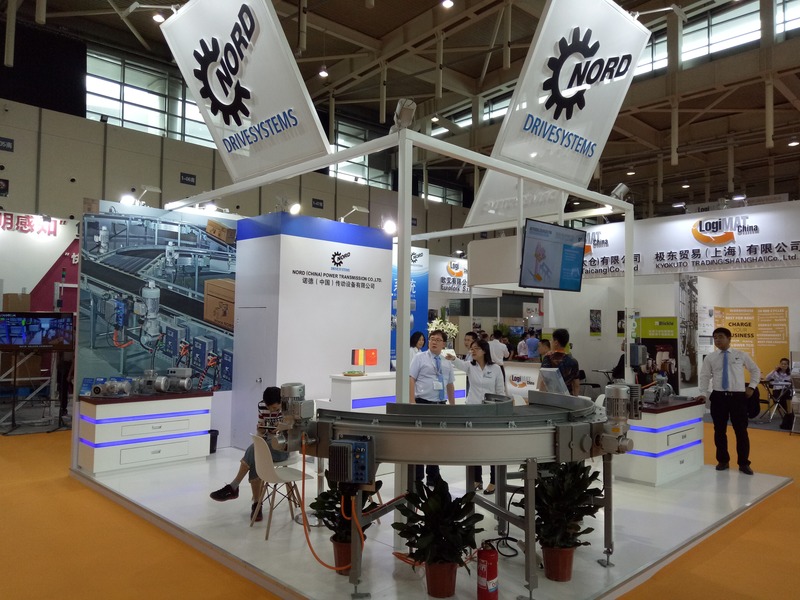 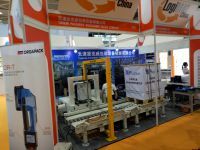 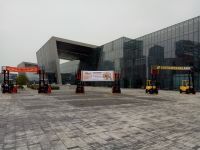 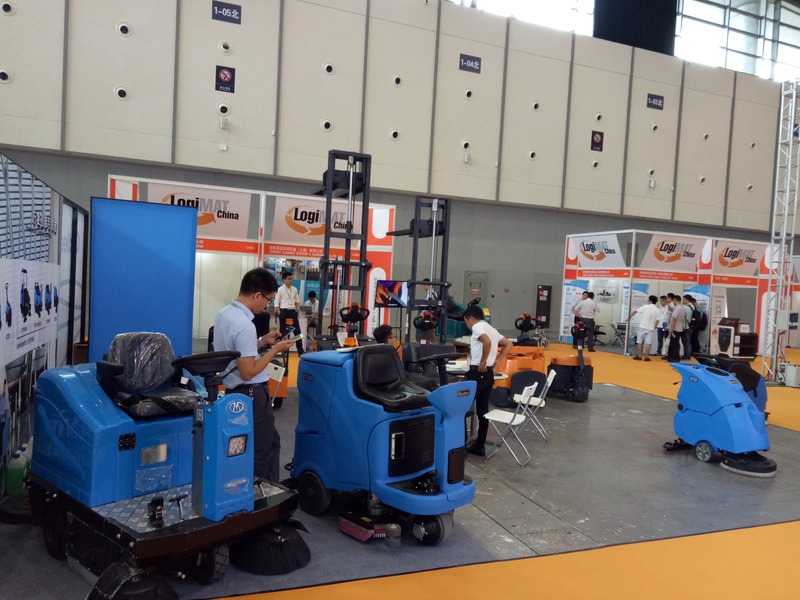 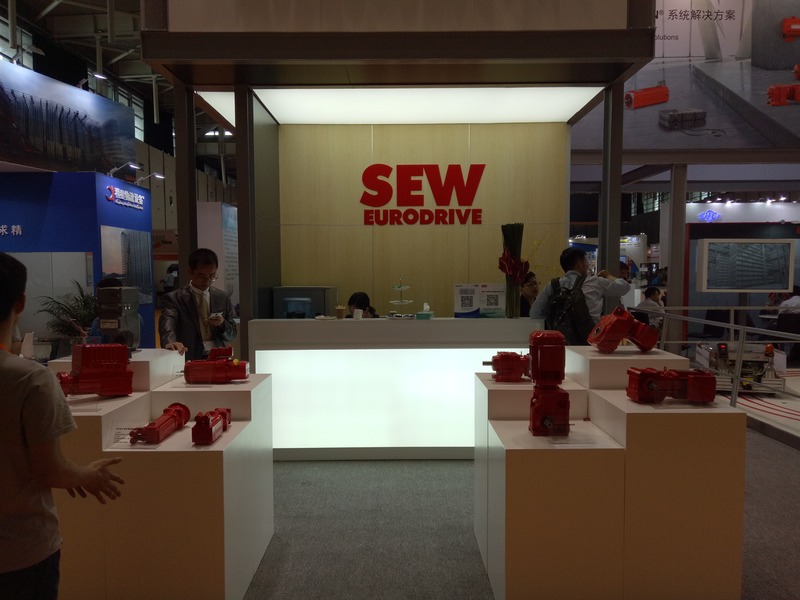 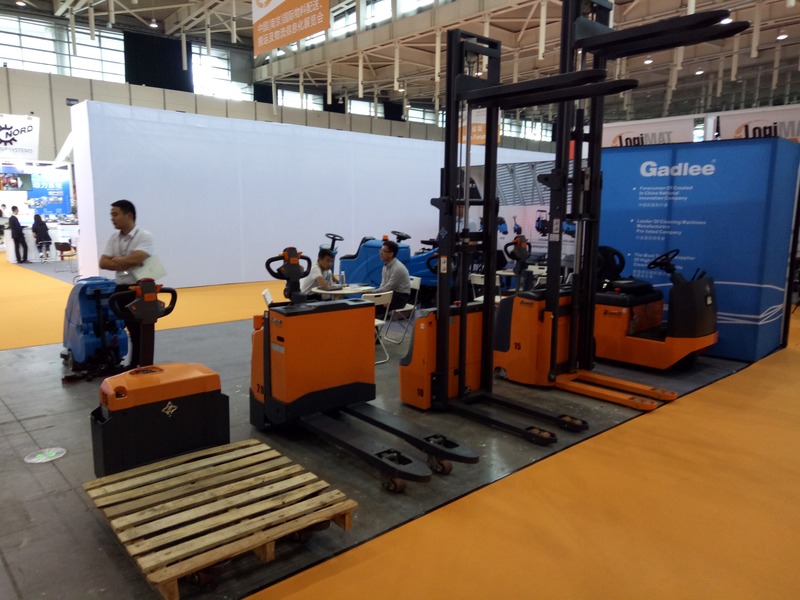 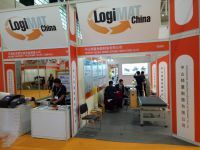 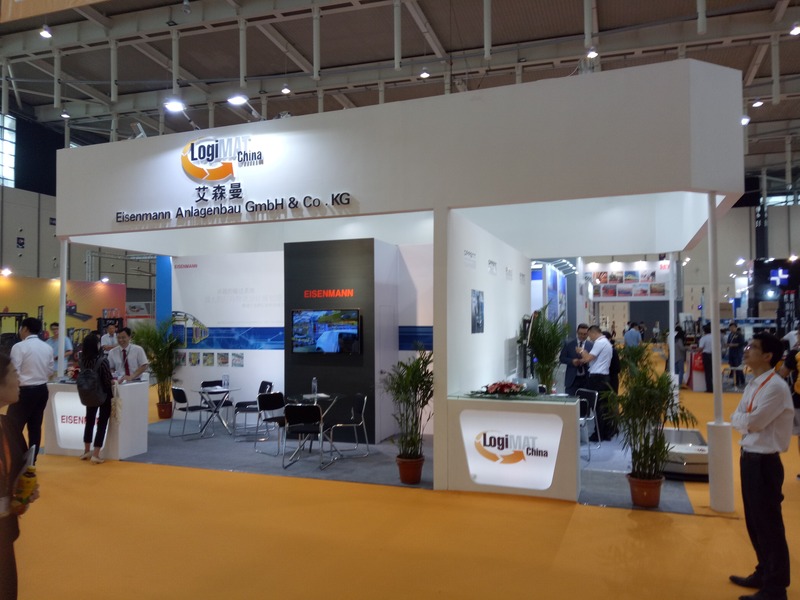 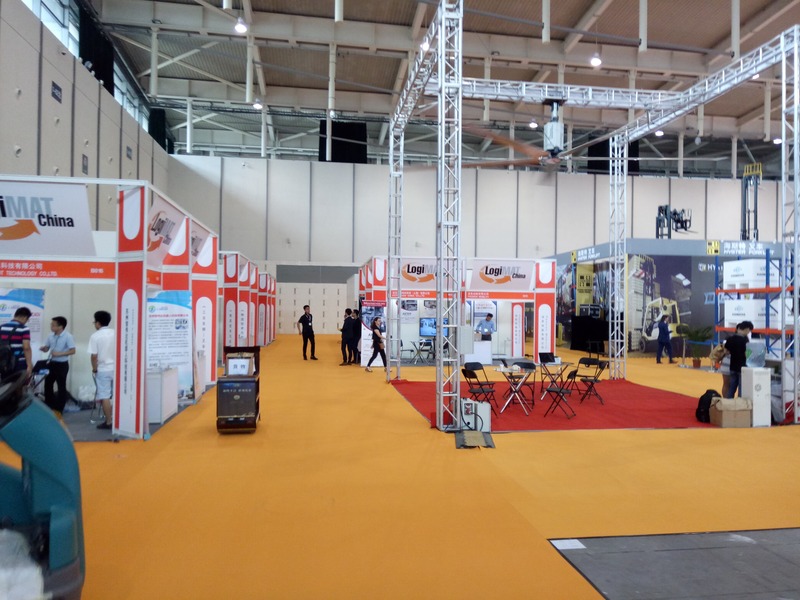 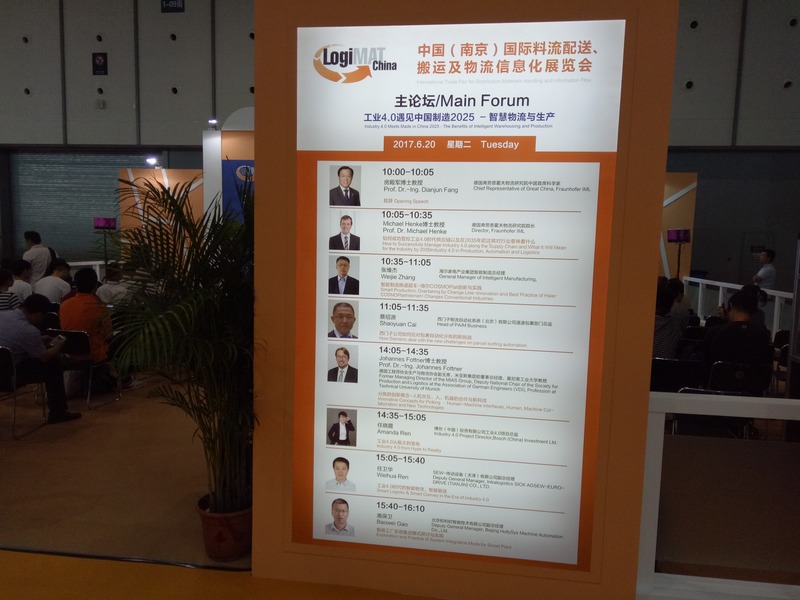 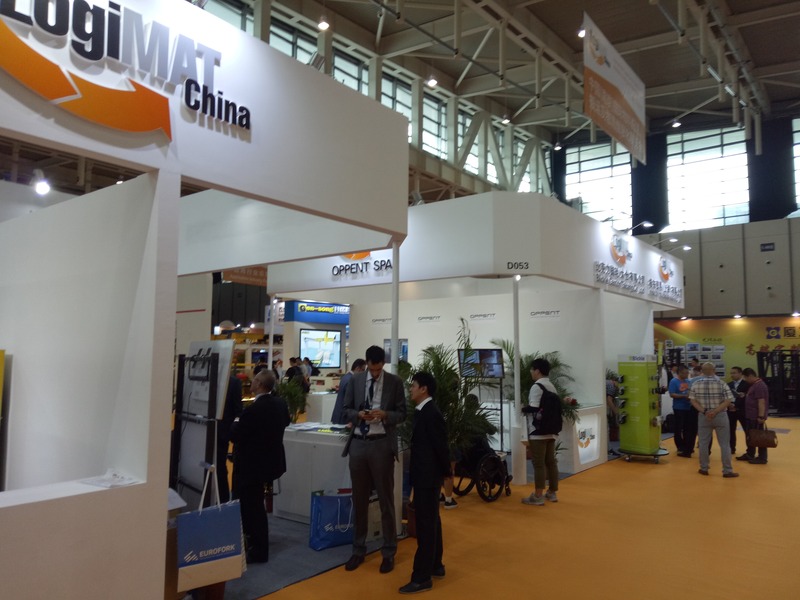 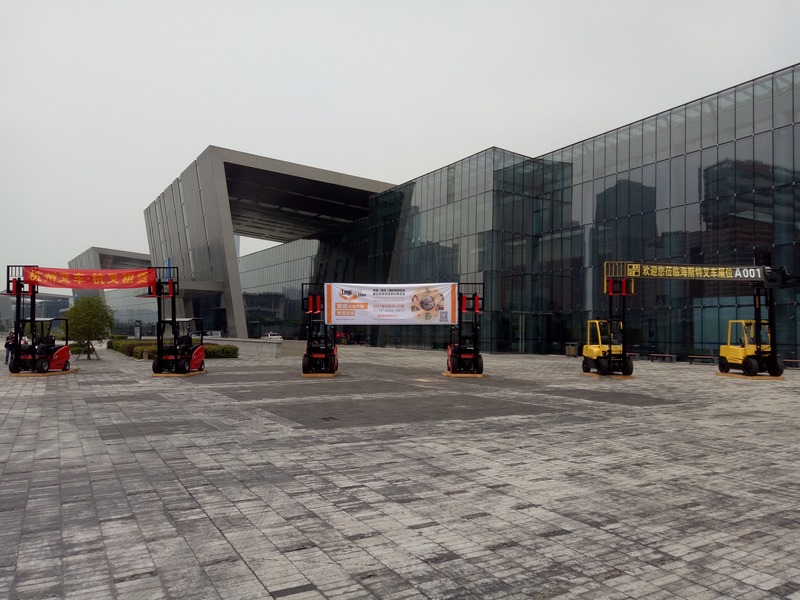 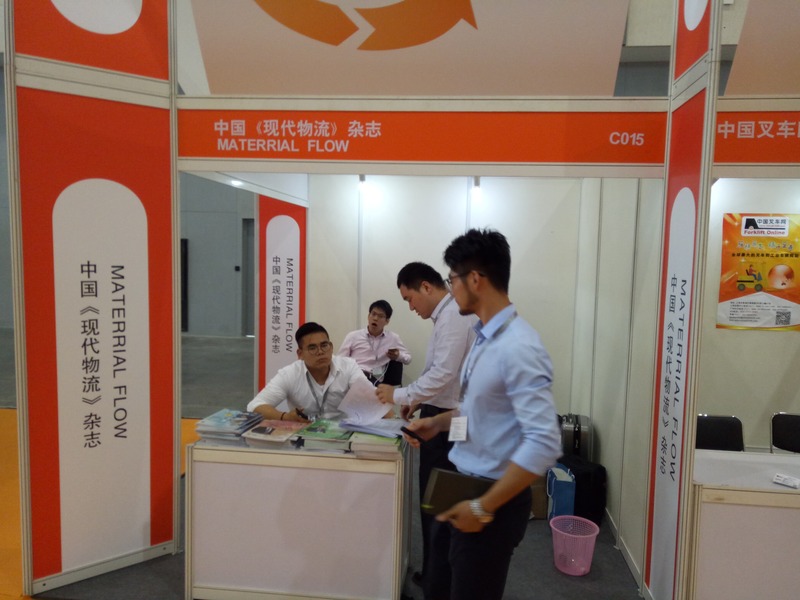 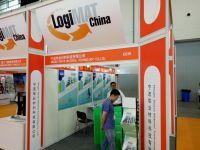 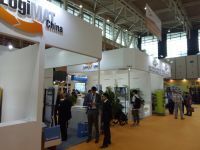 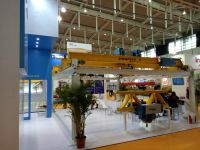 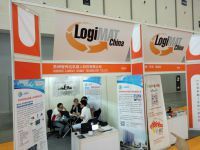 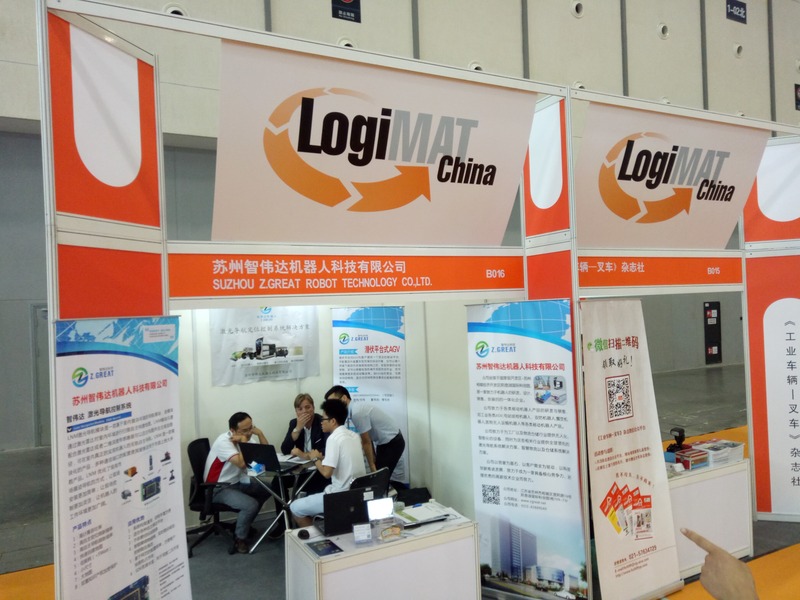 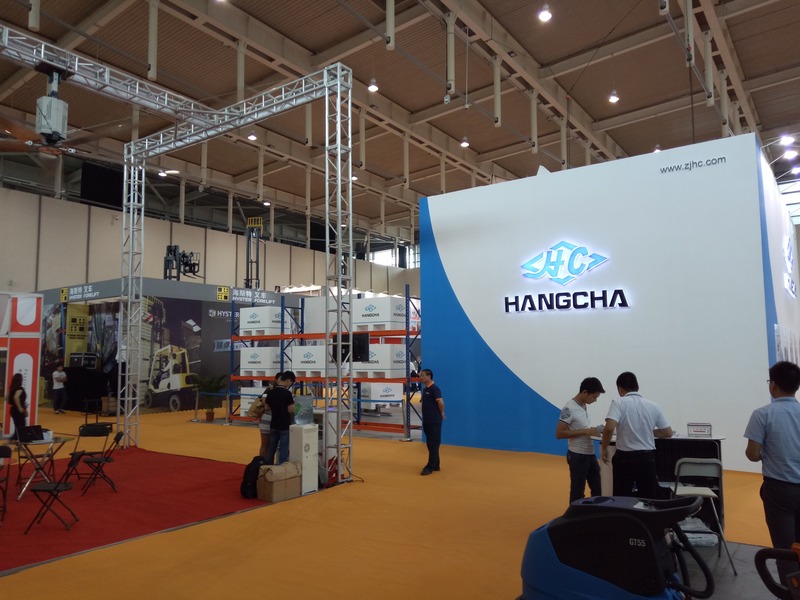 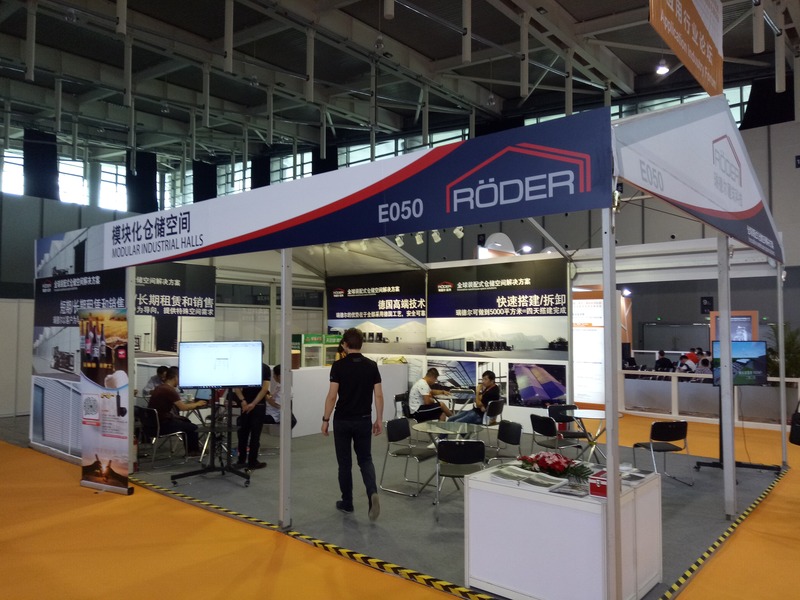 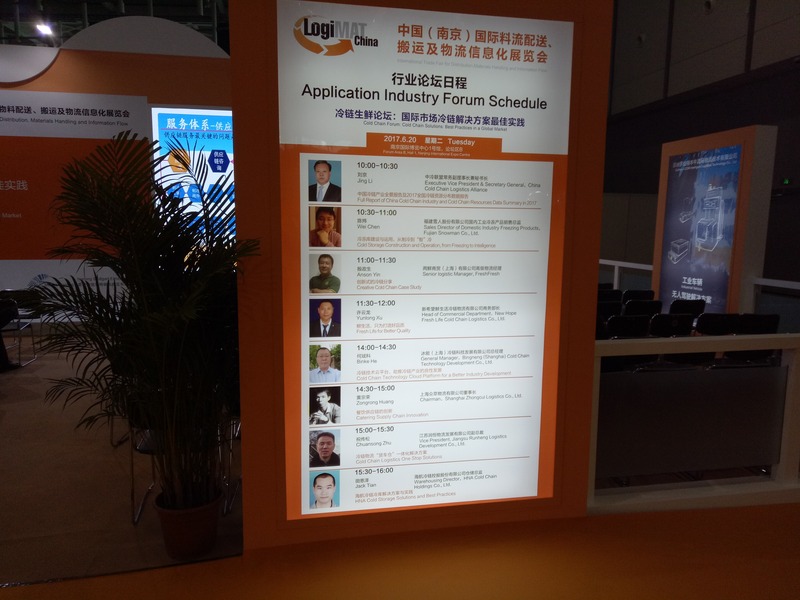 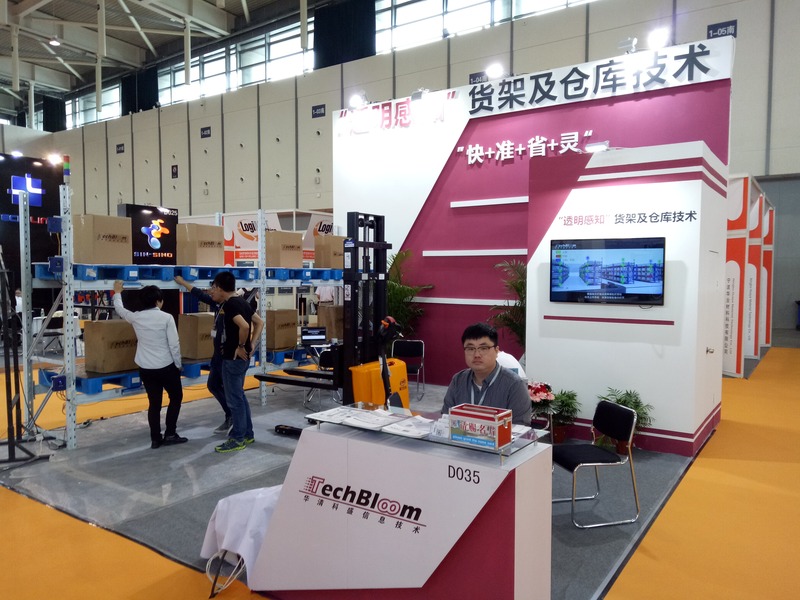 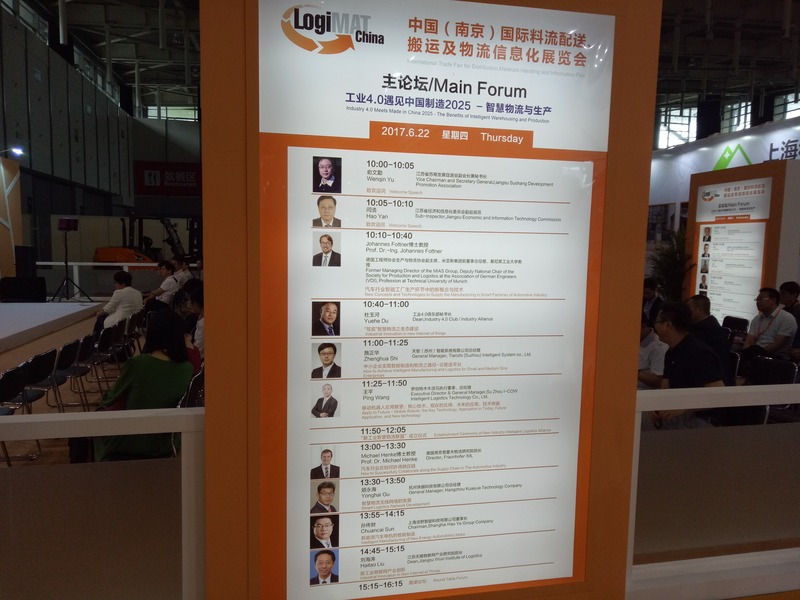 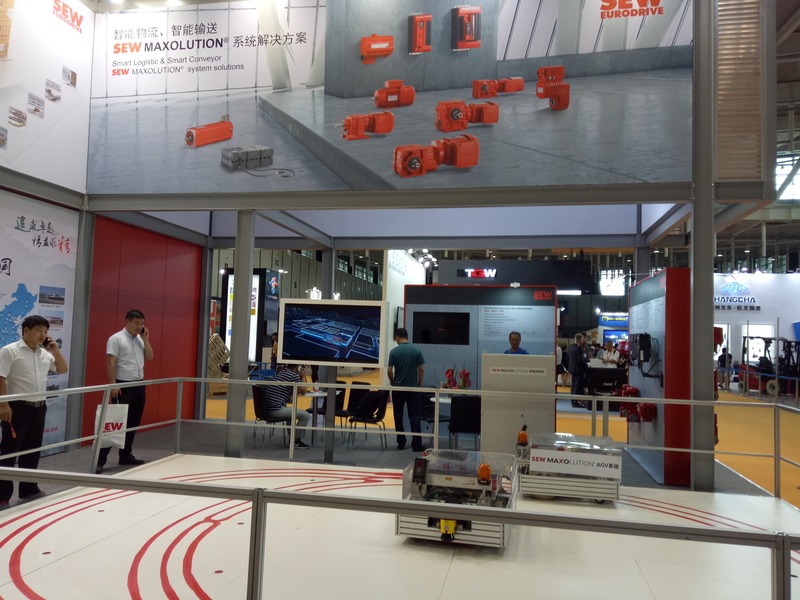 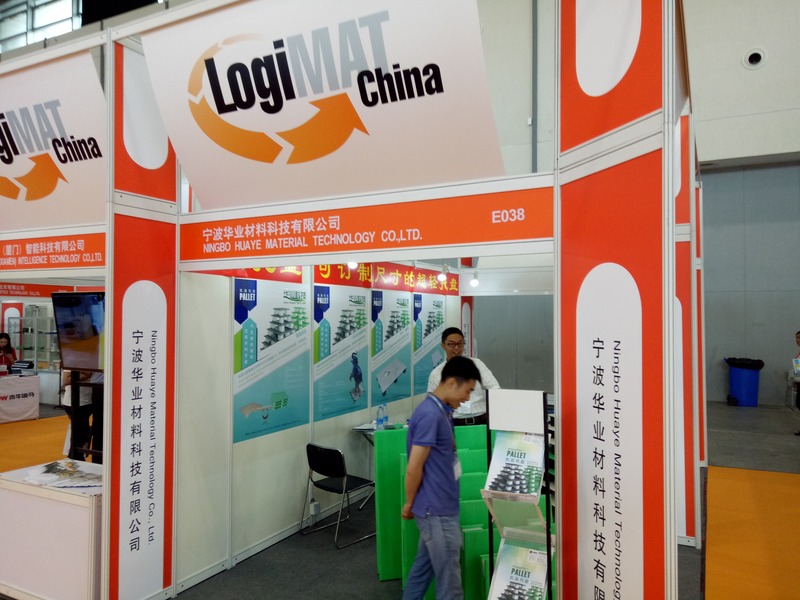 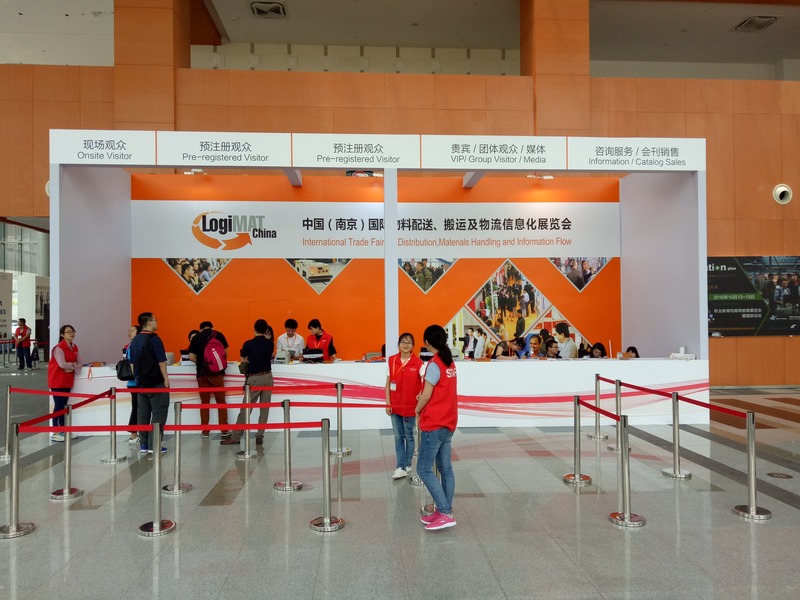 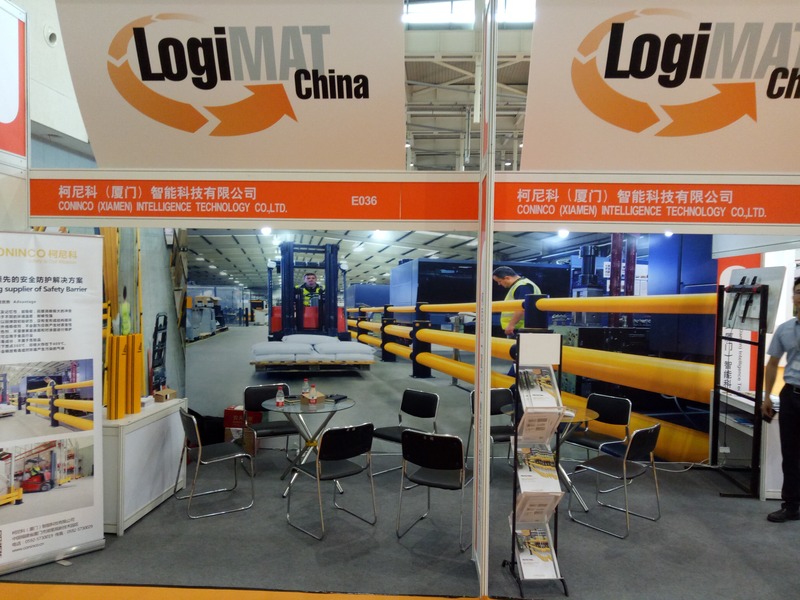 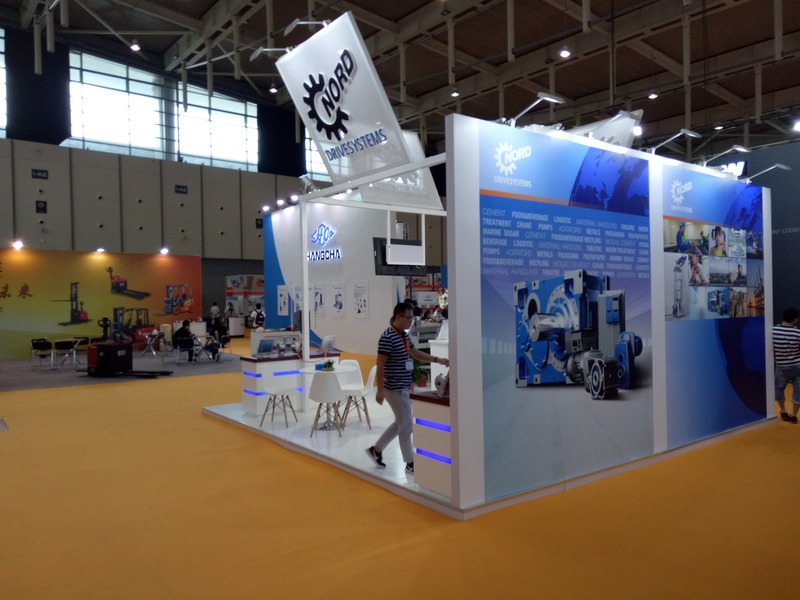 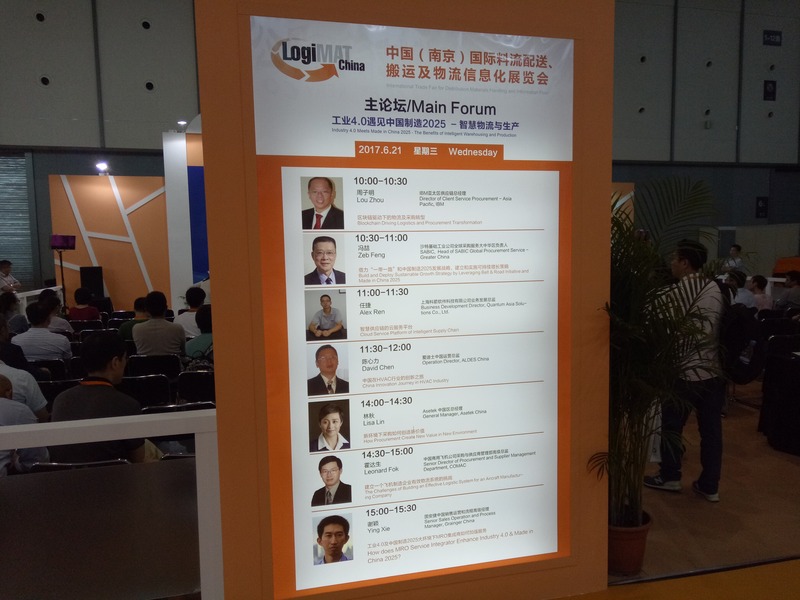 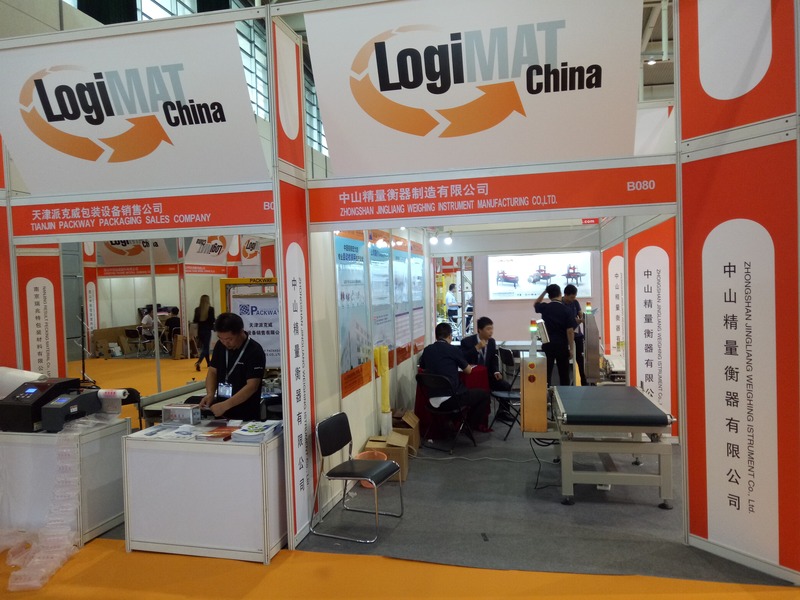 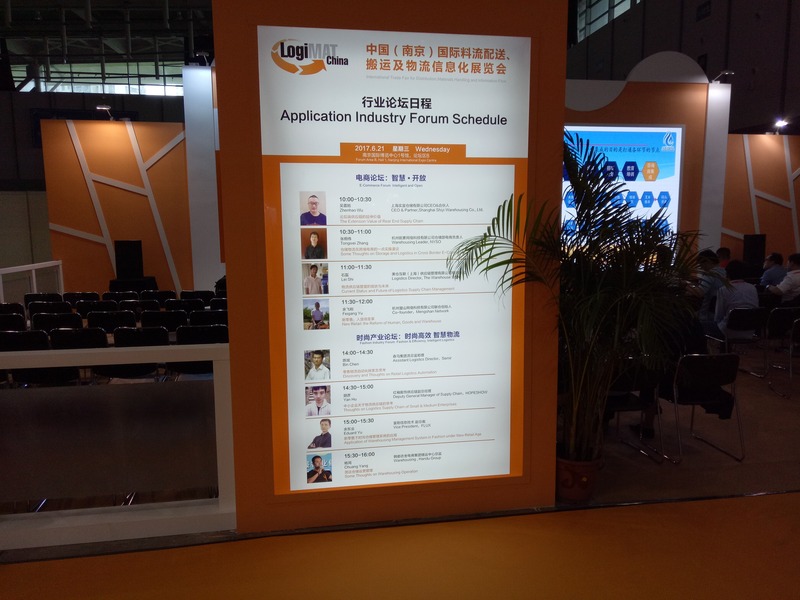 Today, I attended the LogiMAT China 2017 exhibition in Nanjing, an international trade fair for distribution, materials handling, and information flow. 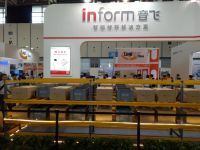 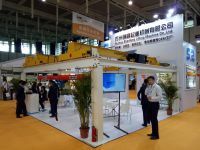 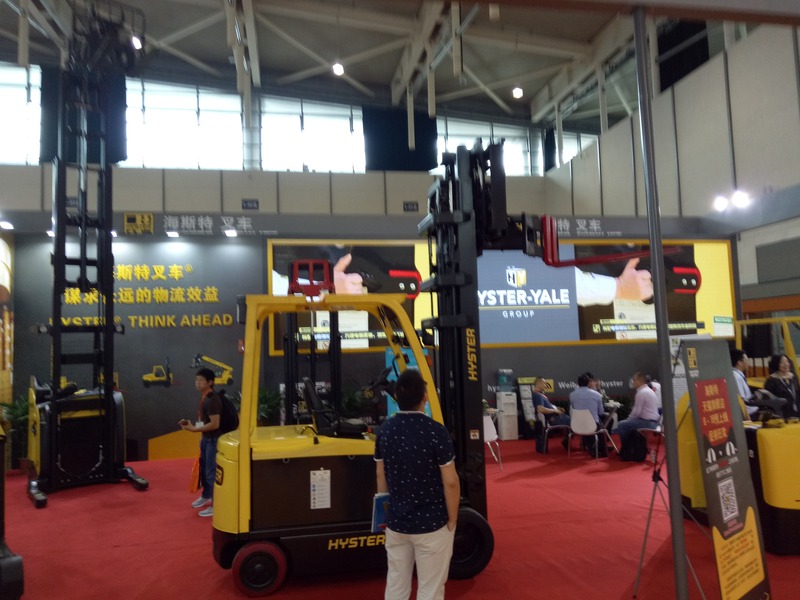 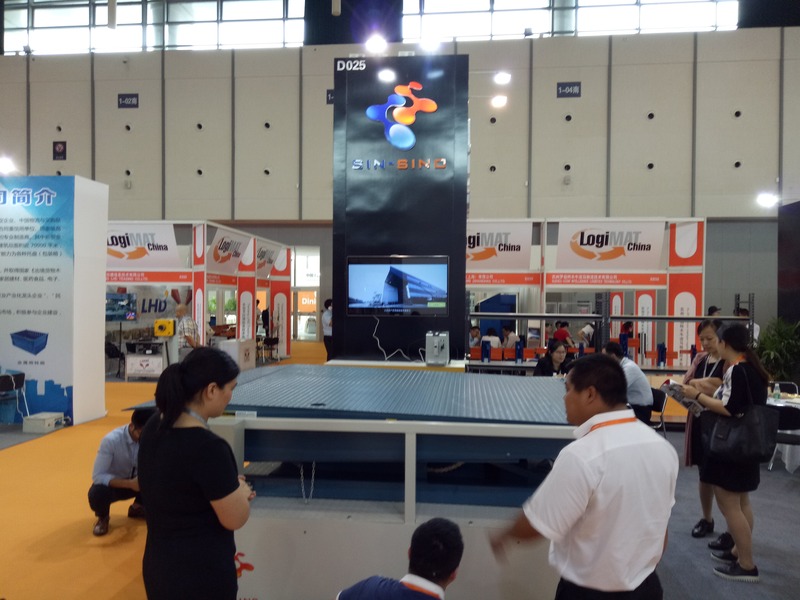 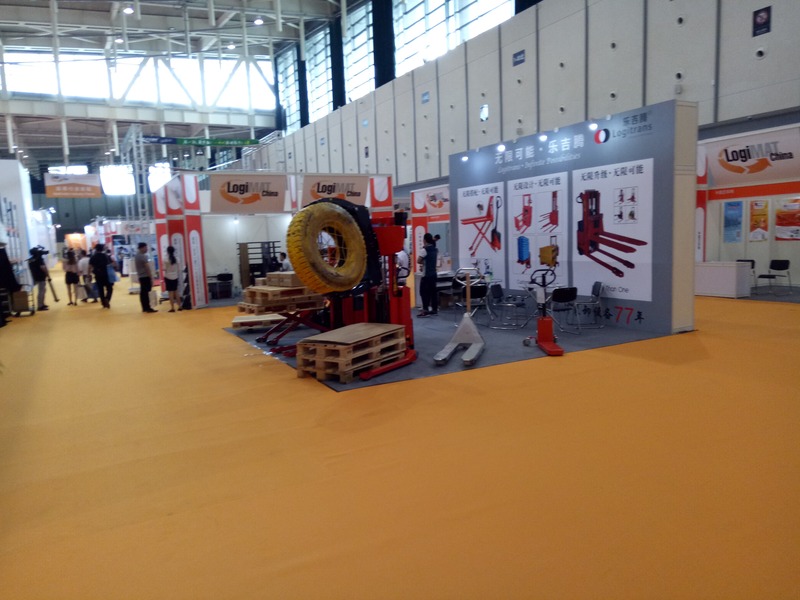 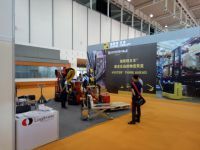 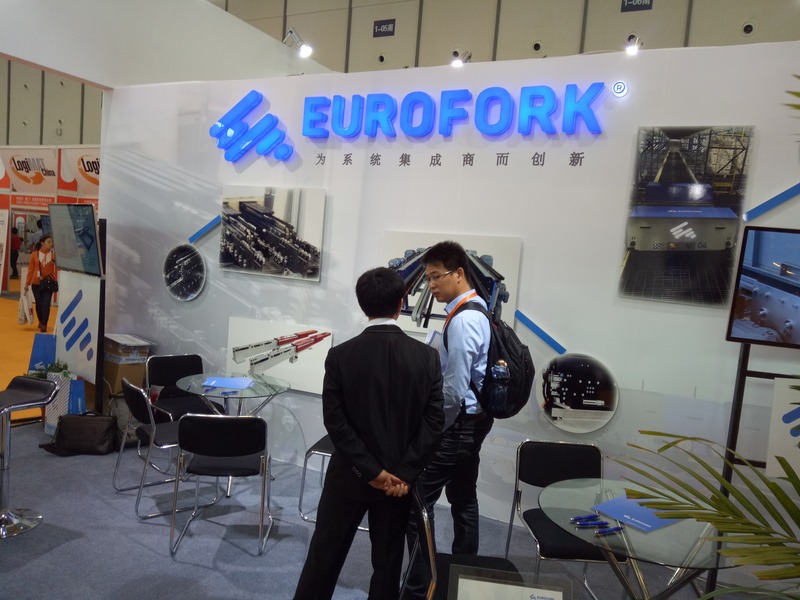 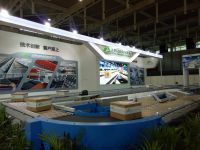 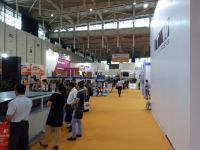 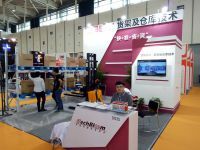 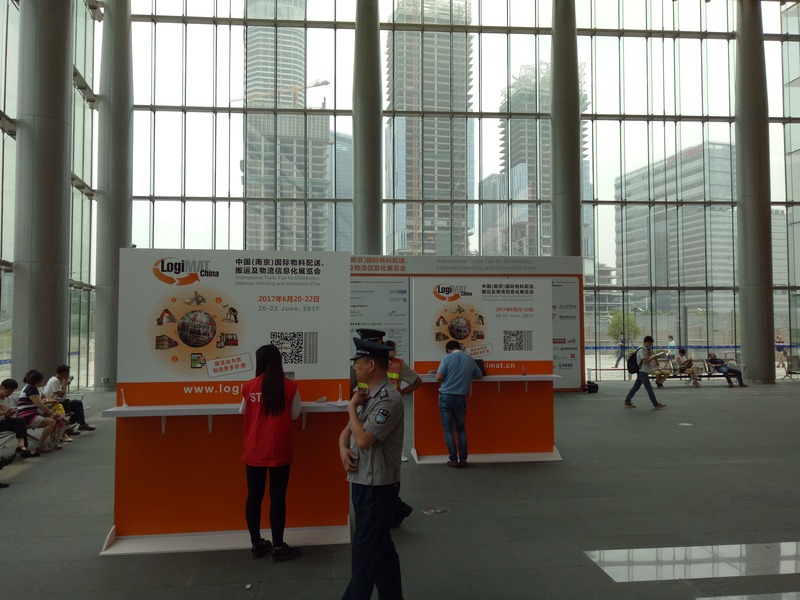 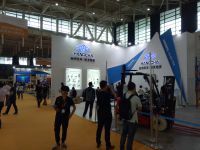 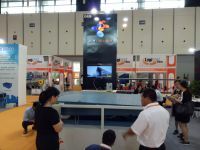 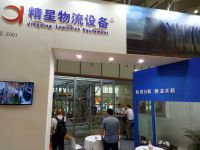 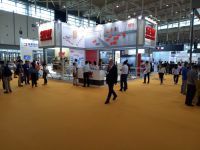 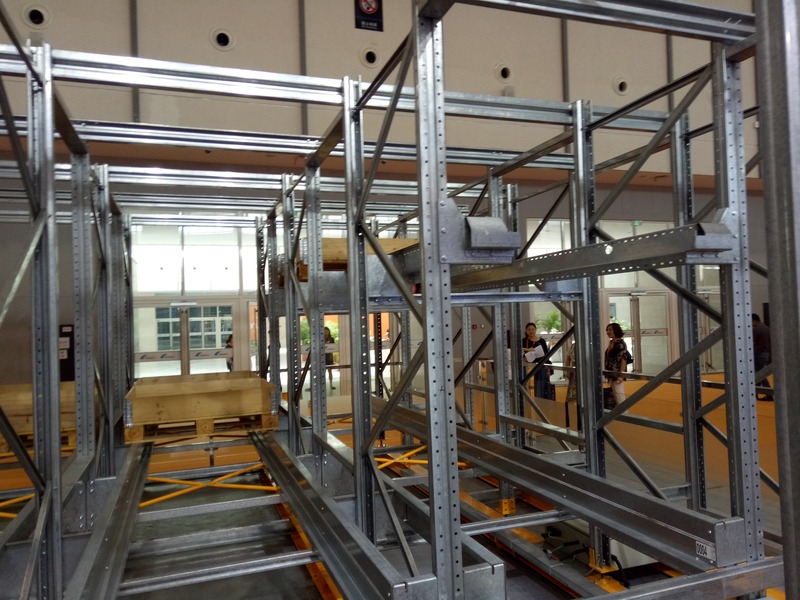 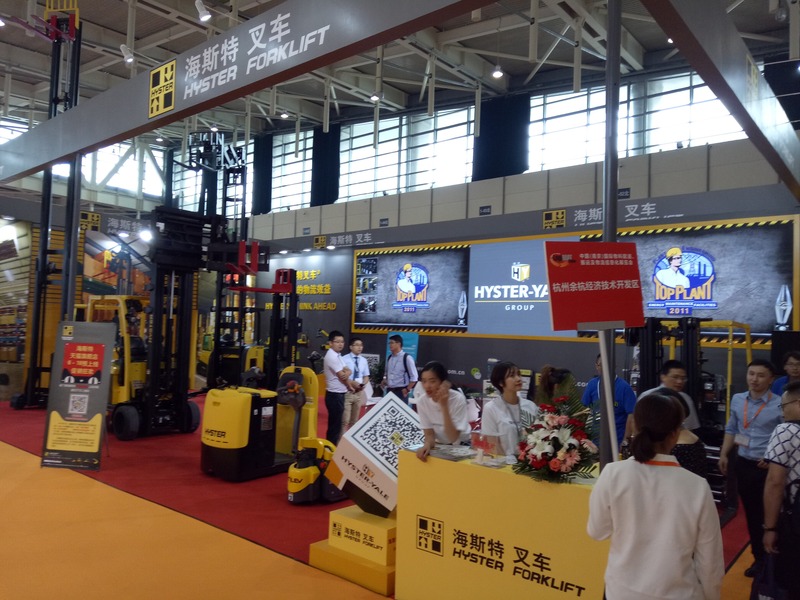 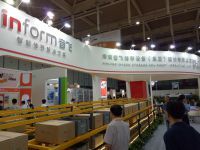 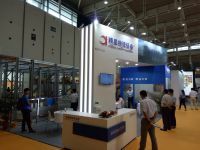 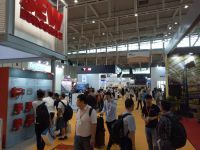 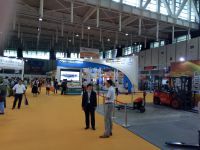 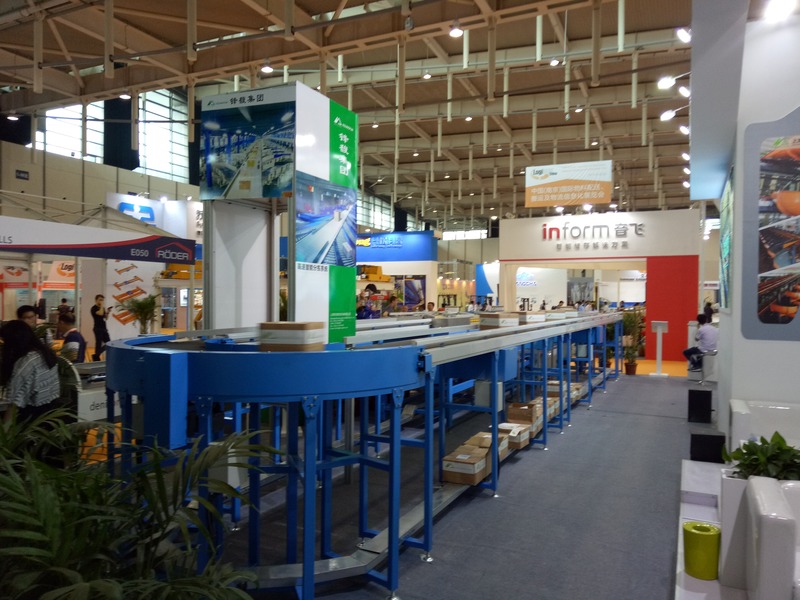 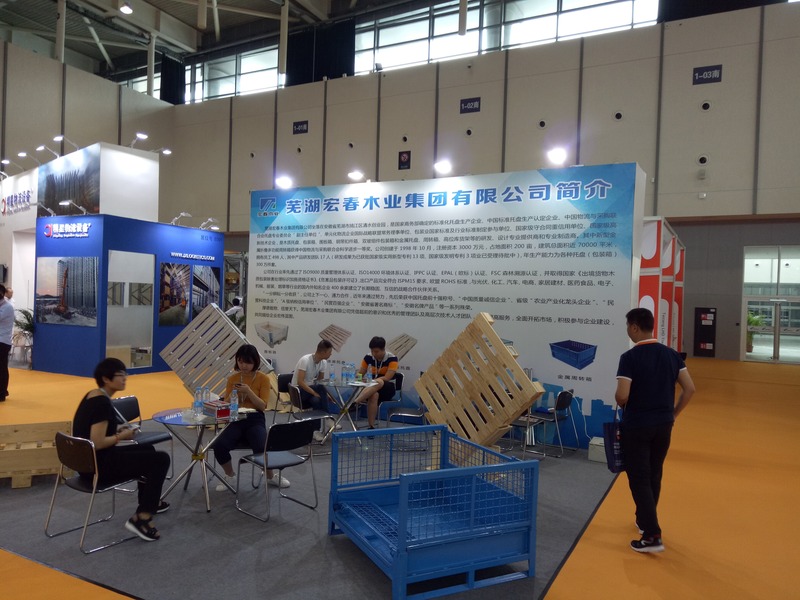 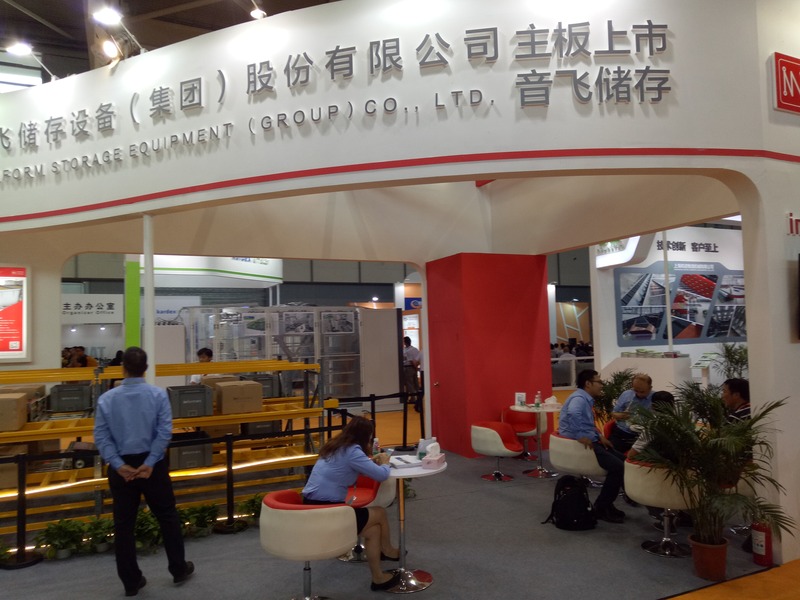 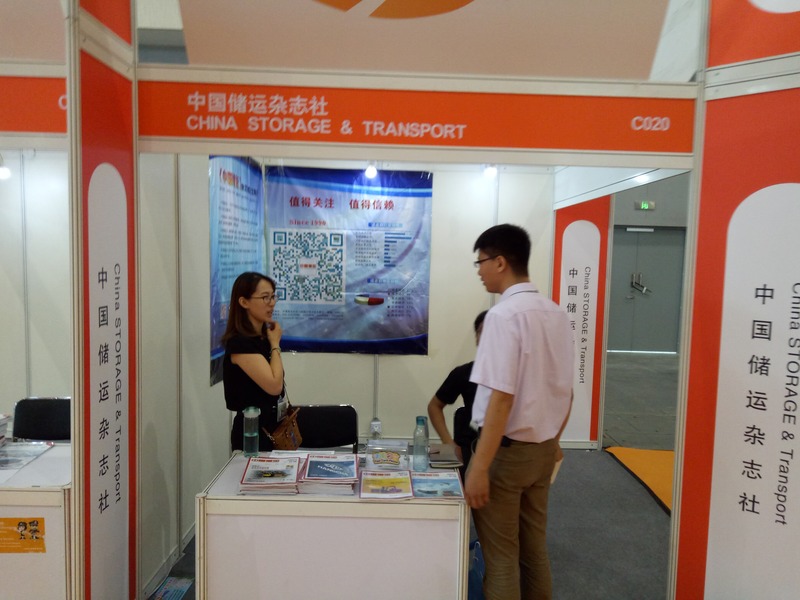 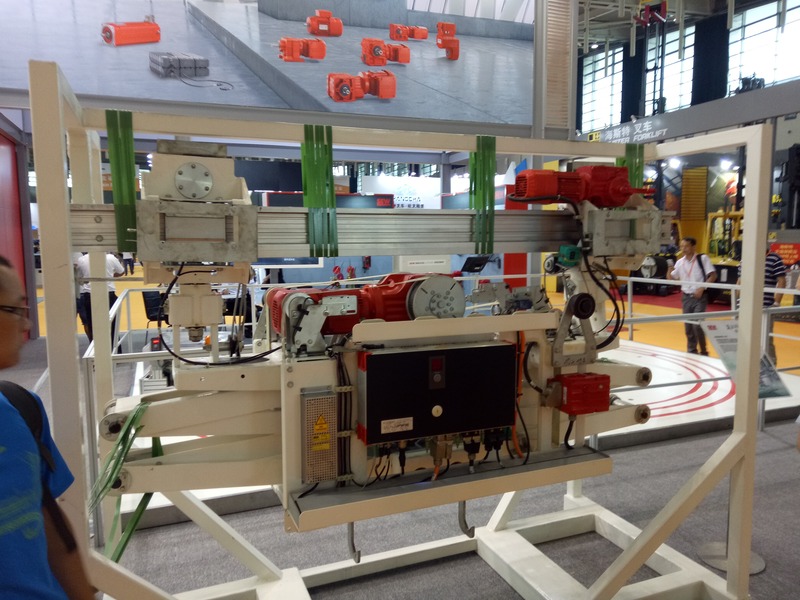 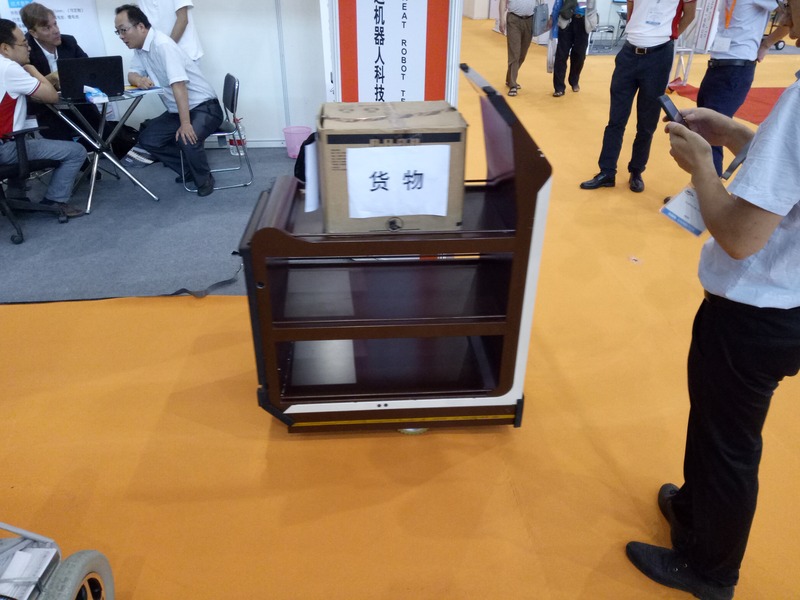 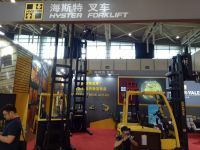 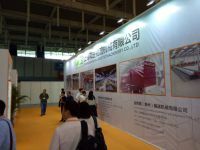 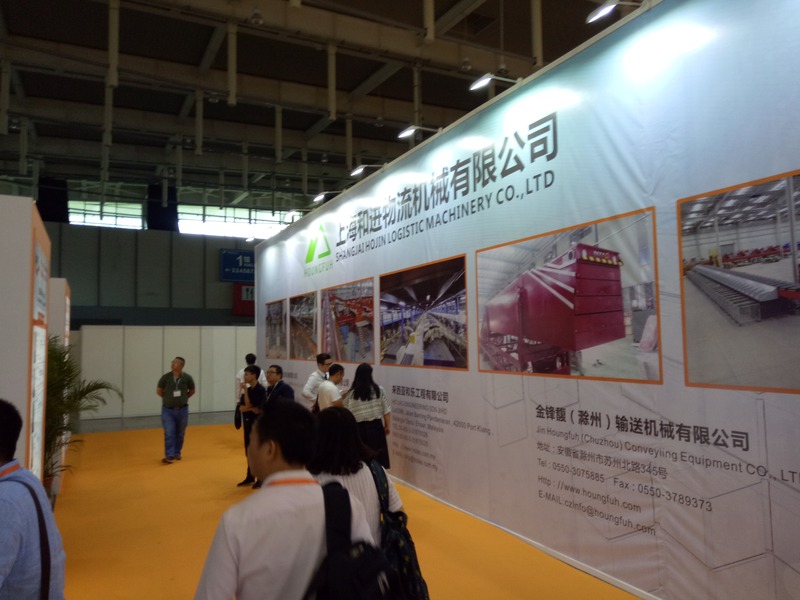 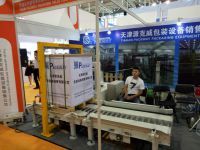 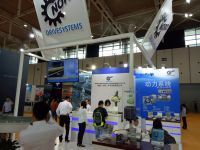 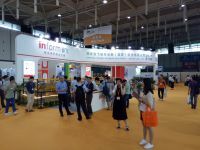 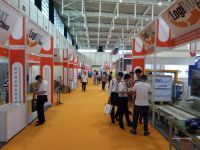 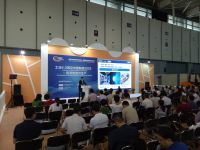 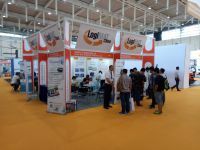 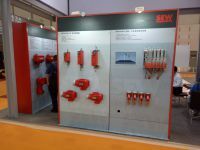 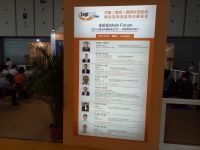 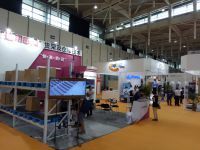 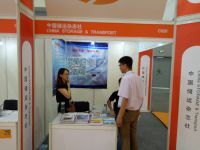 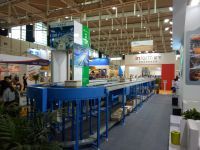 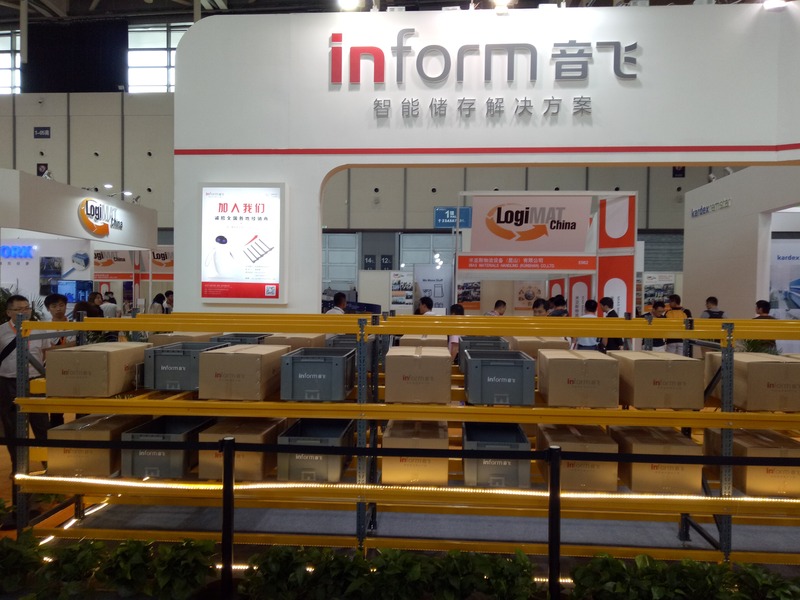 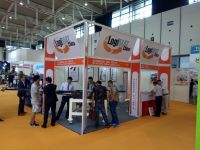 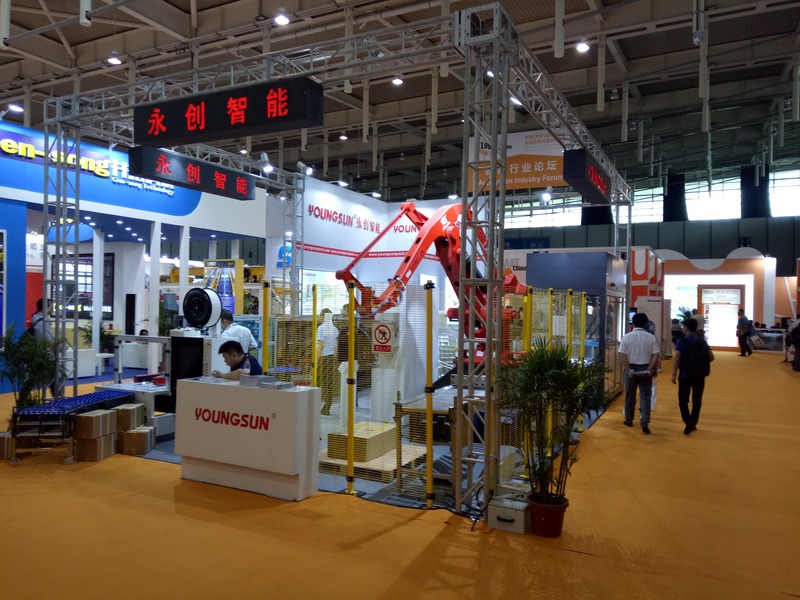 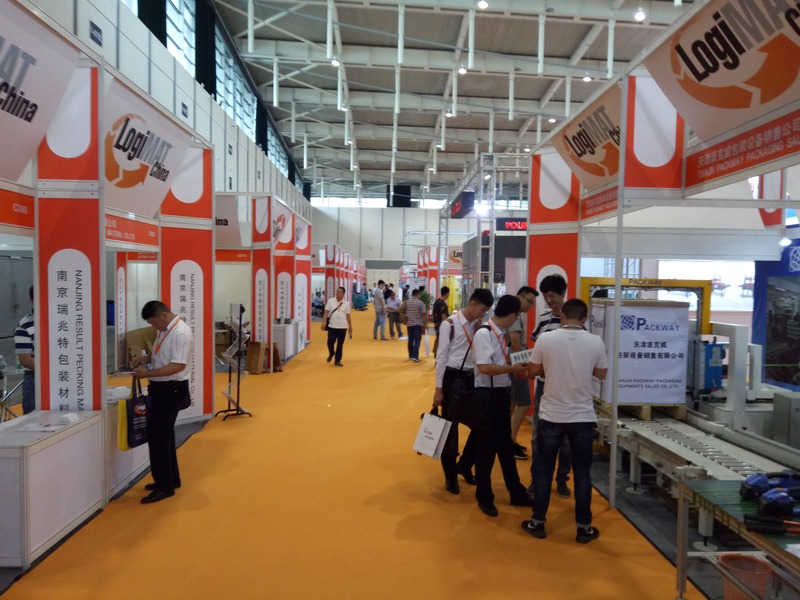 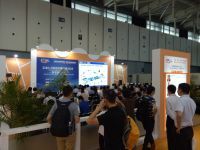 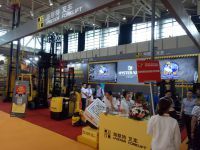 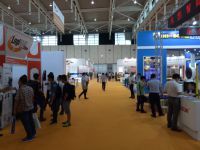 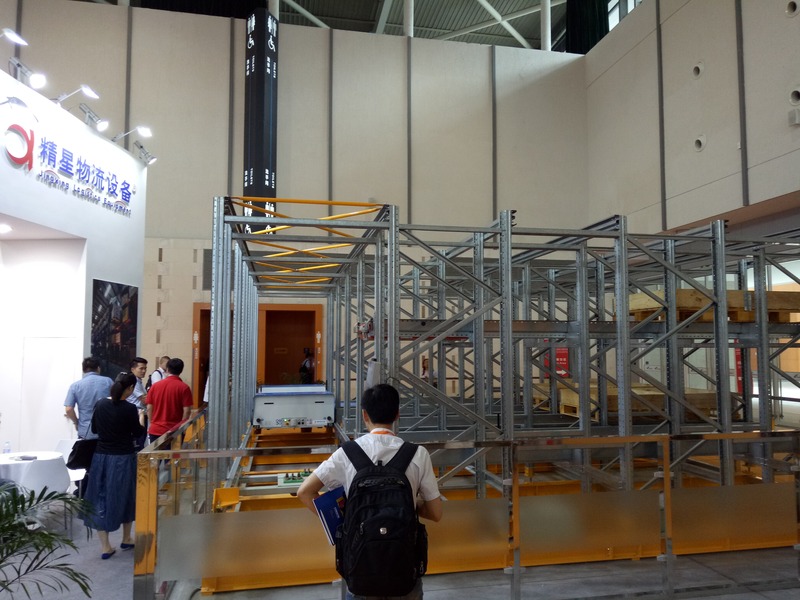 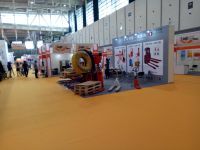 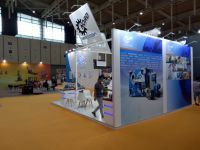 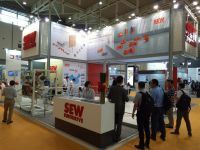 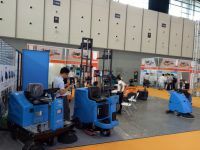 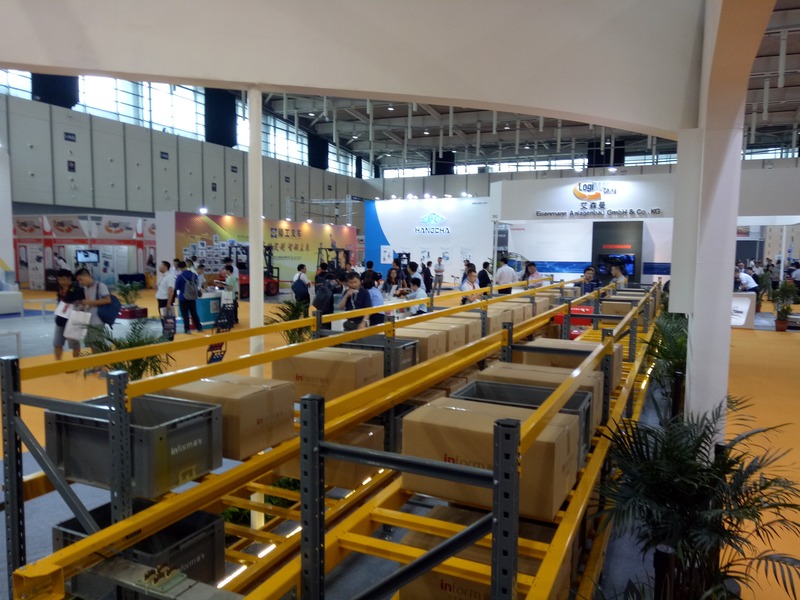 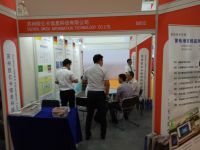 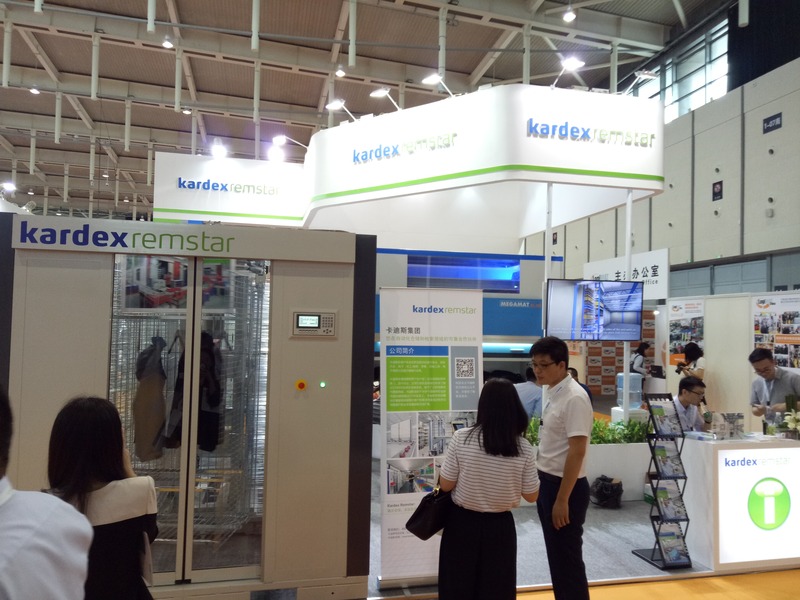 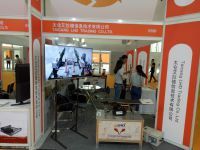 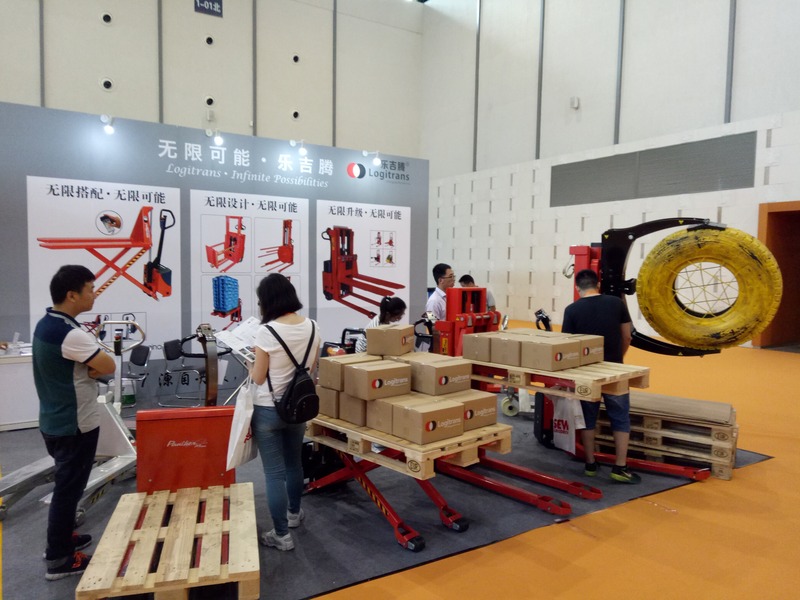 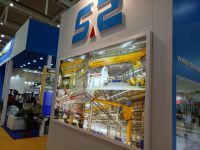 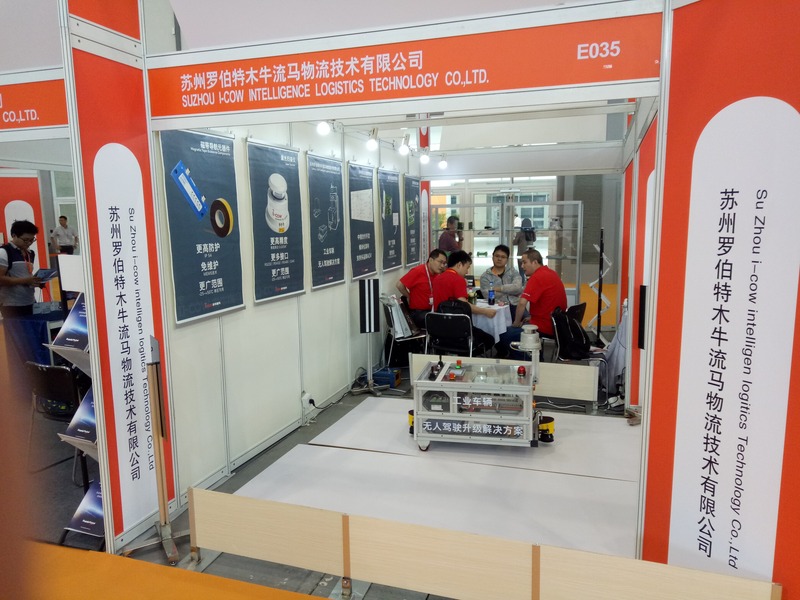 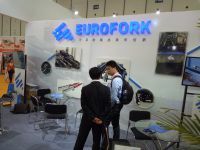 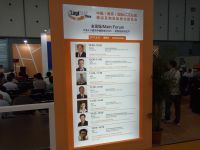 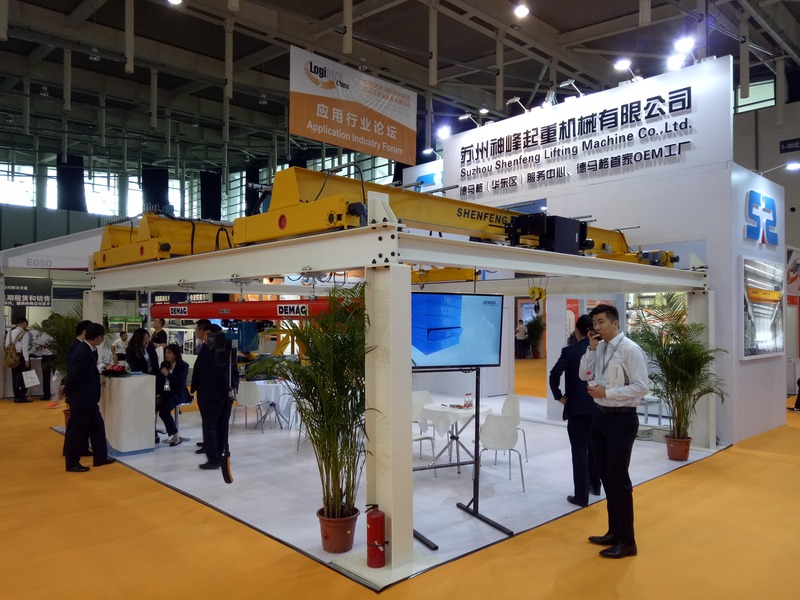 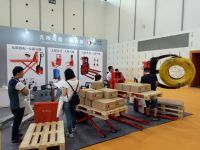 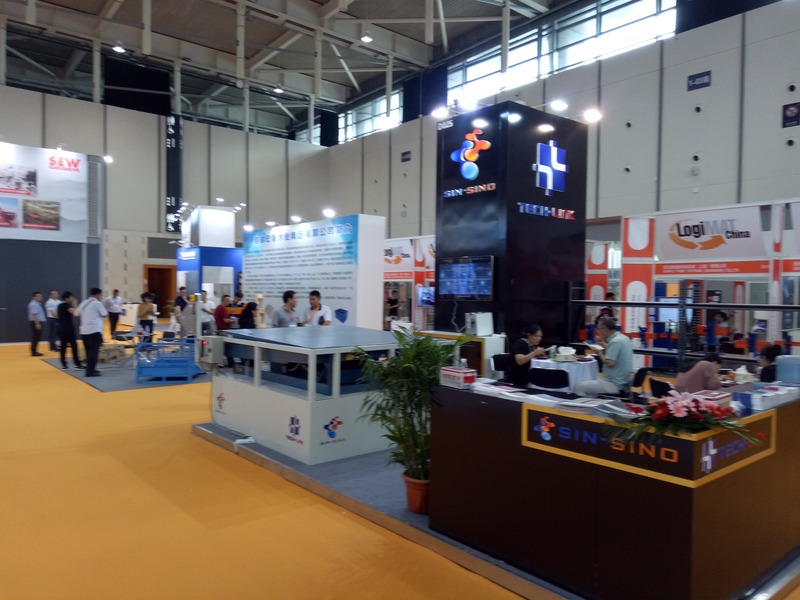 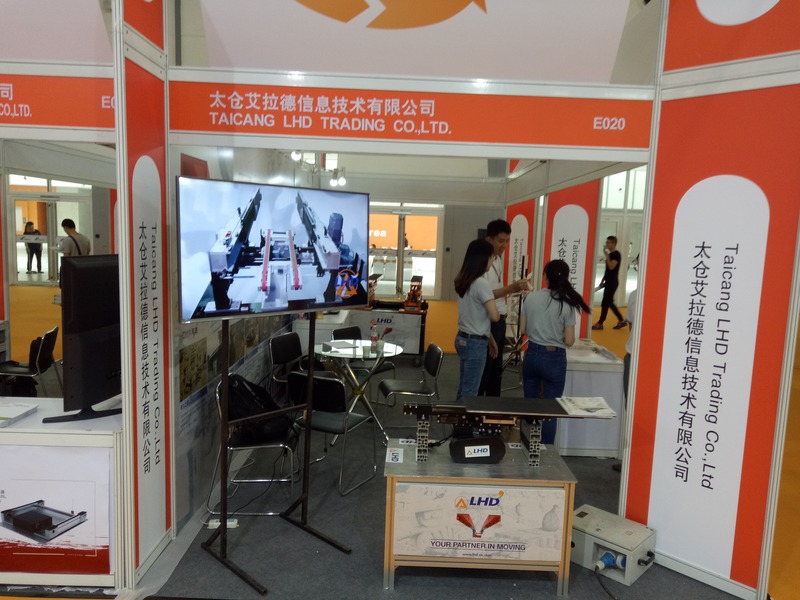 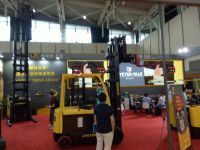 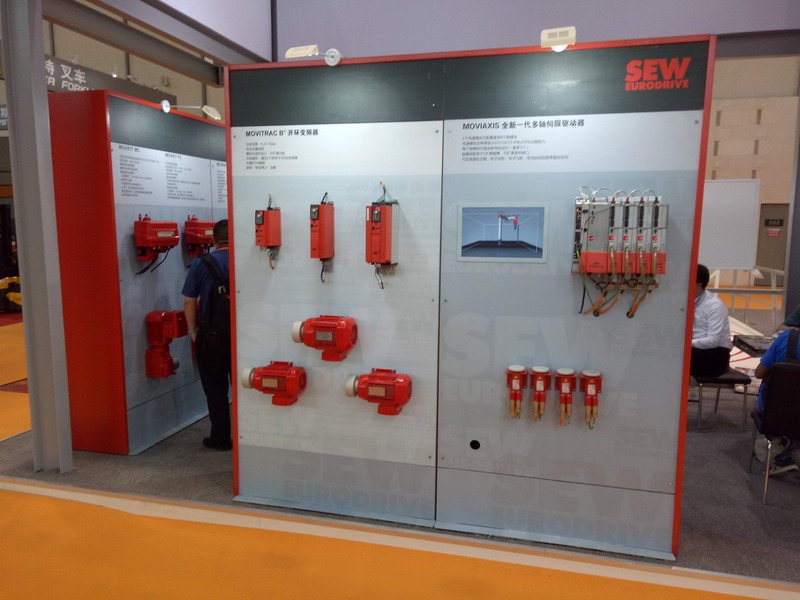 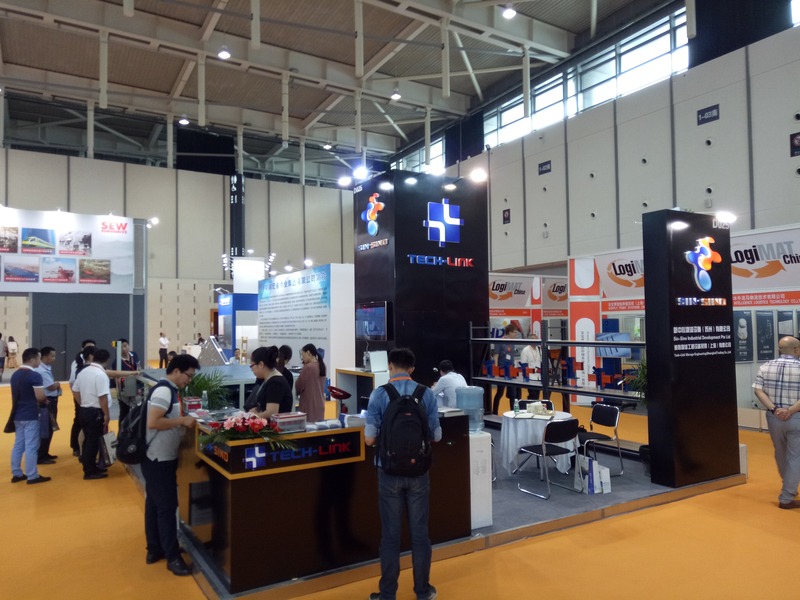 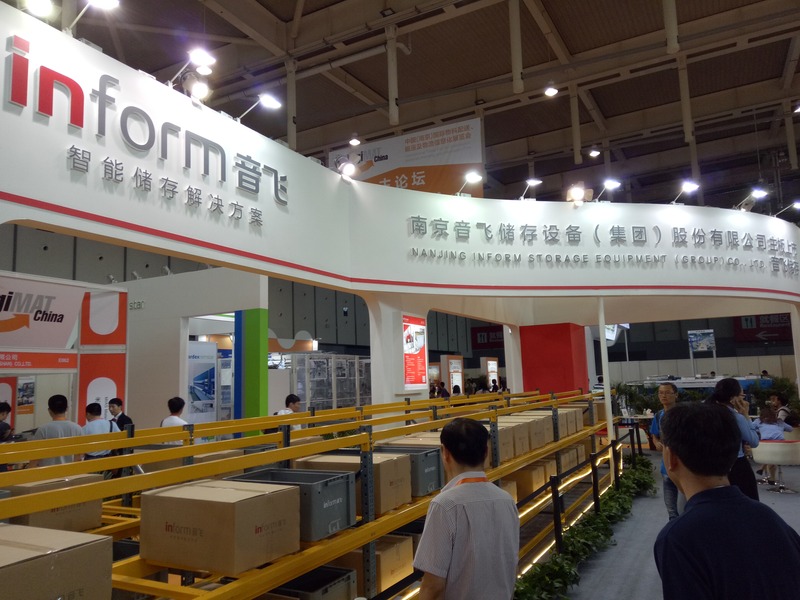 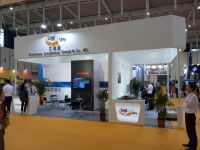 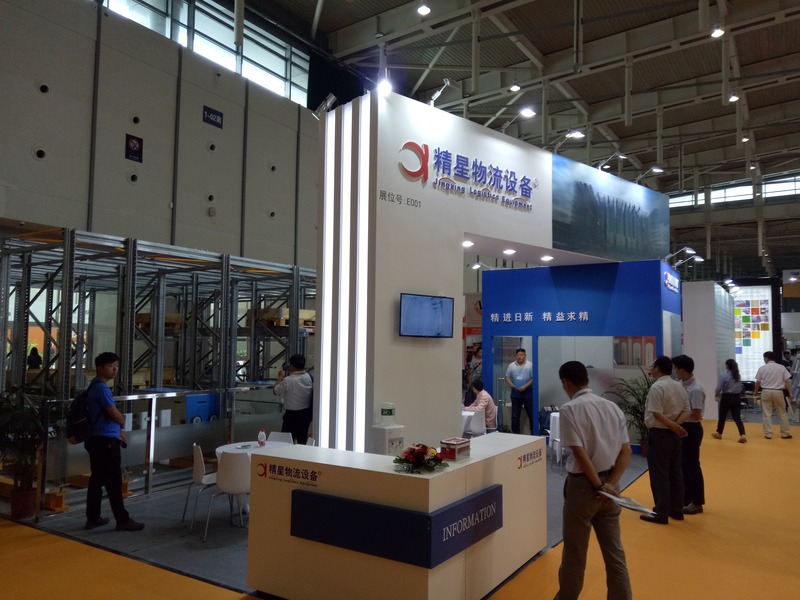 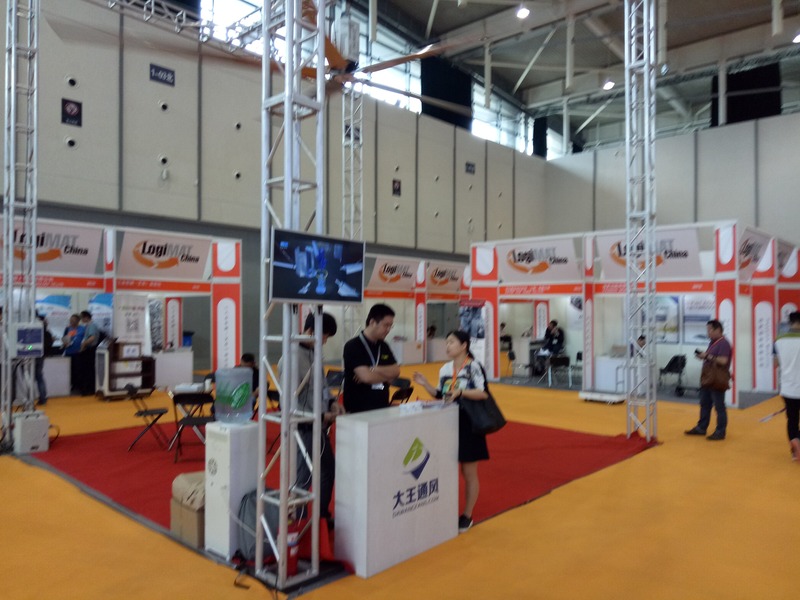 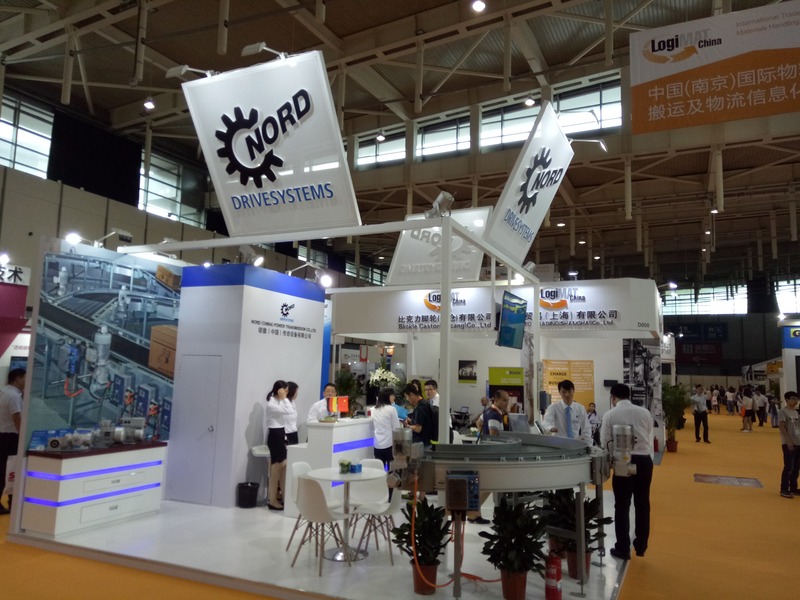 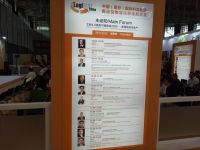 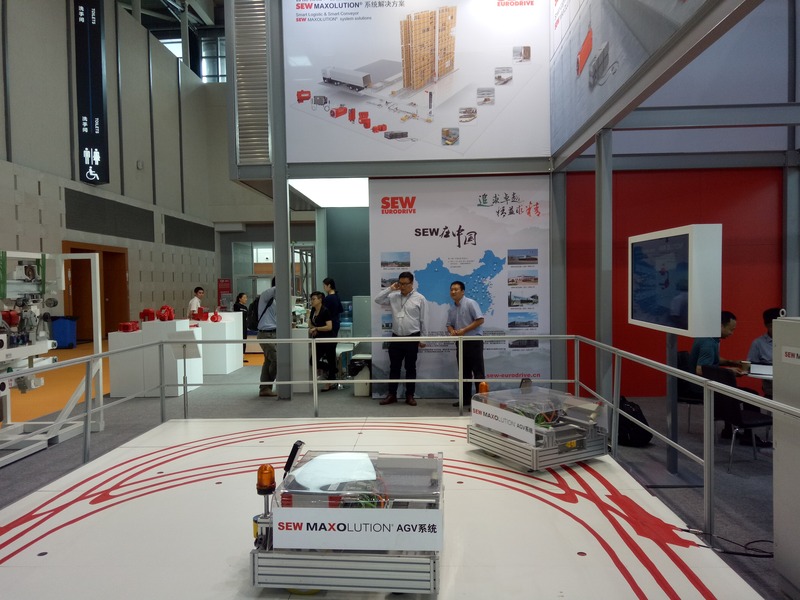 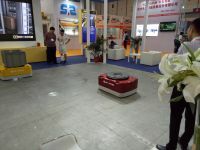 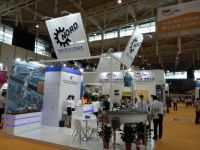 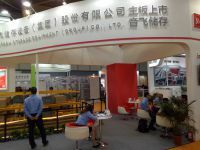 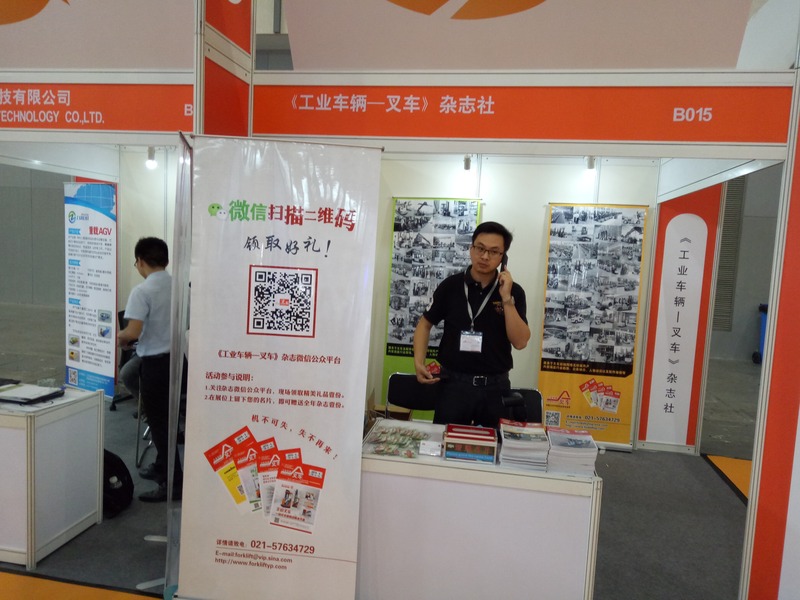 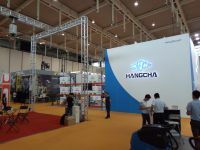 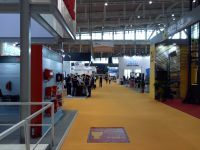 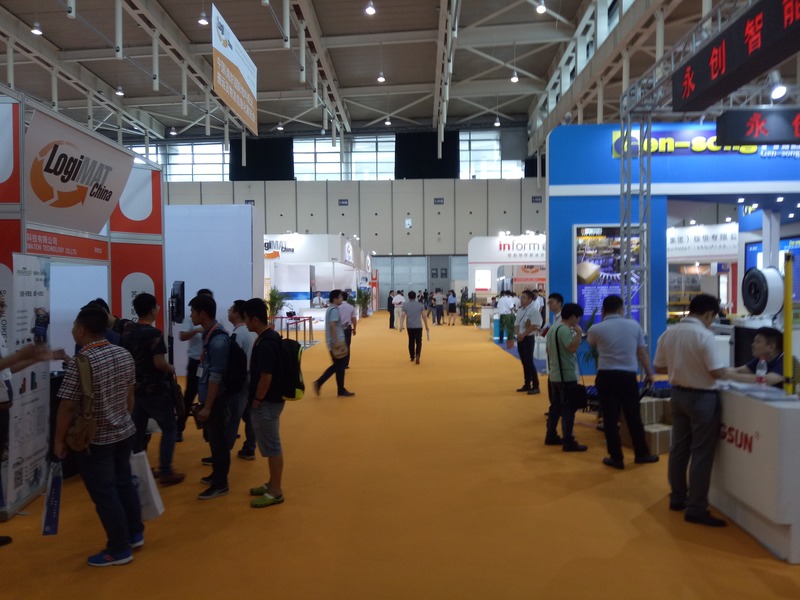 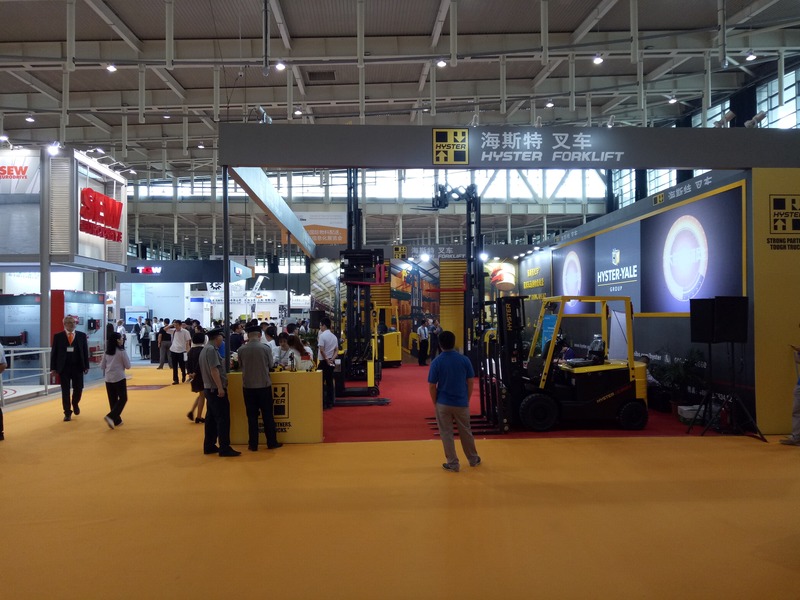 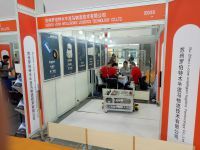 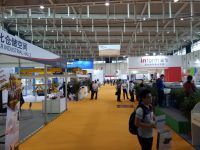 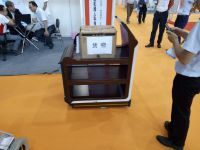 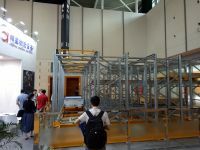 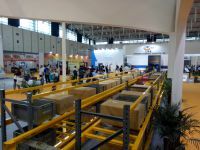 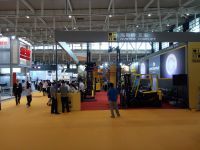 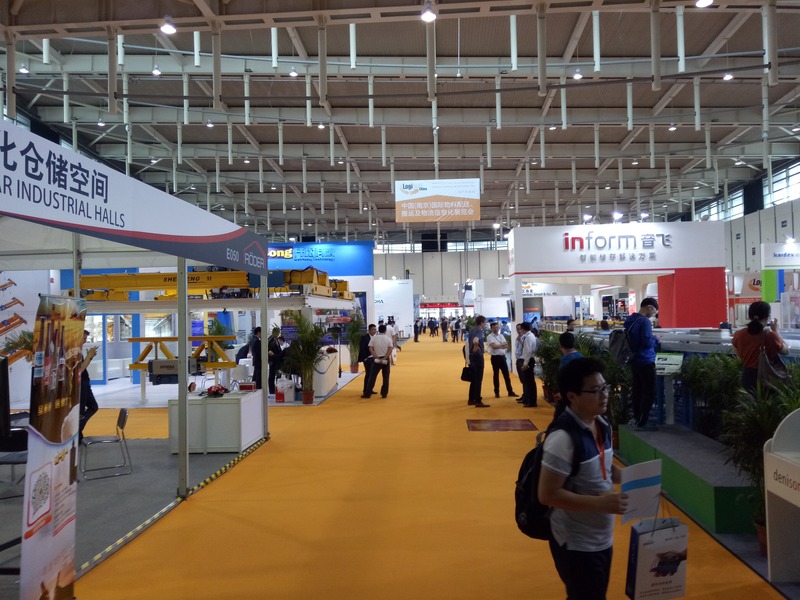 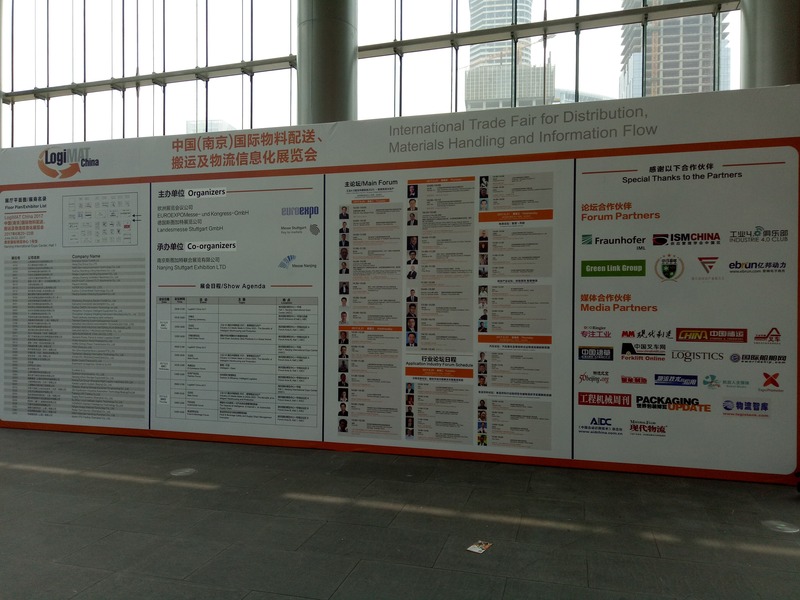 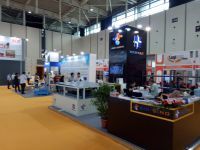 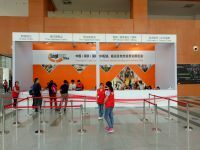 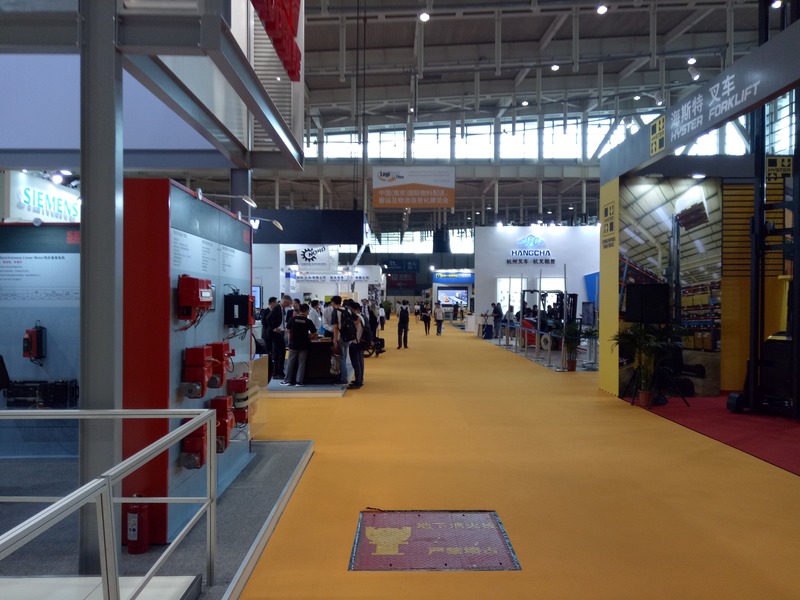 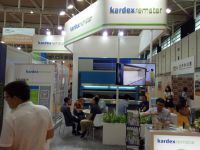 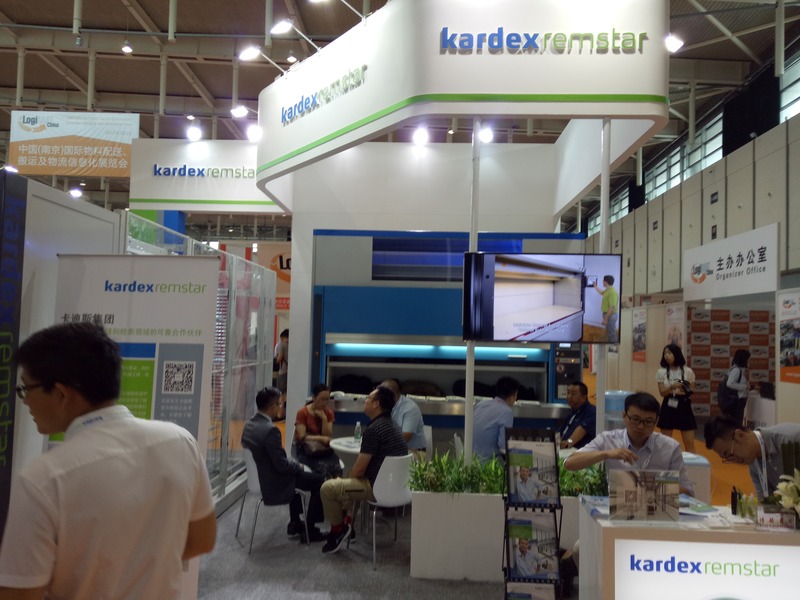 This year, I already visited three exhibitions on logistics and transportation: The fresh logistics and Intertraffic exhibitions were mainly concerned "hardware," either indoor or outdoor, and Intermodal focused mainly on container-based, well, intermodal, logistics. 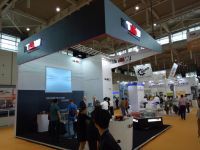 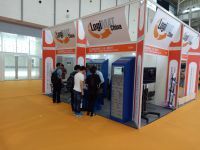 (All three, however, also had exhibits and presentations on IT solutions.) 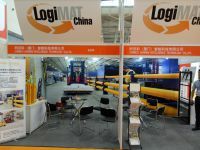 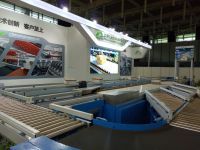 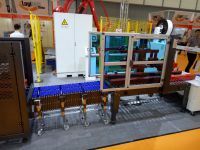 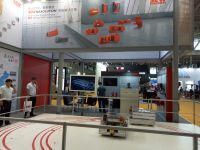 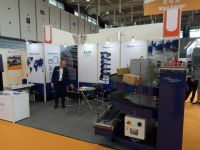 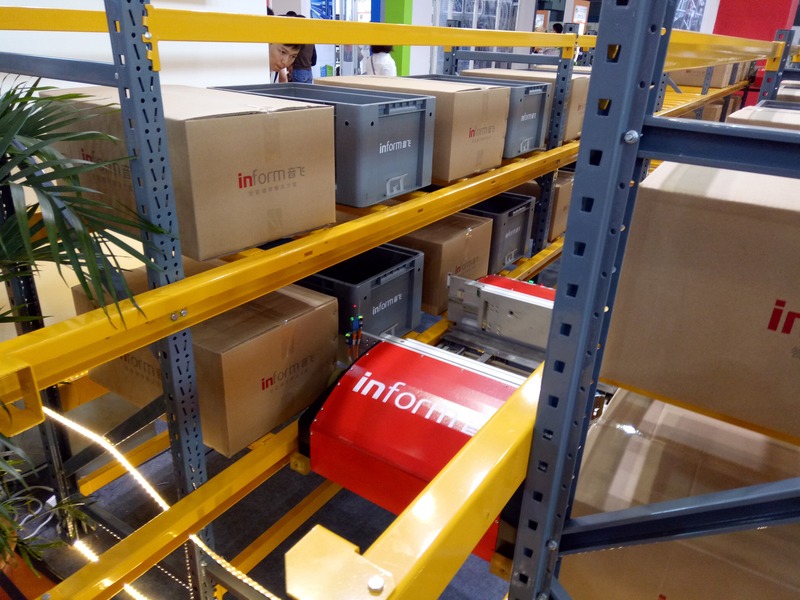 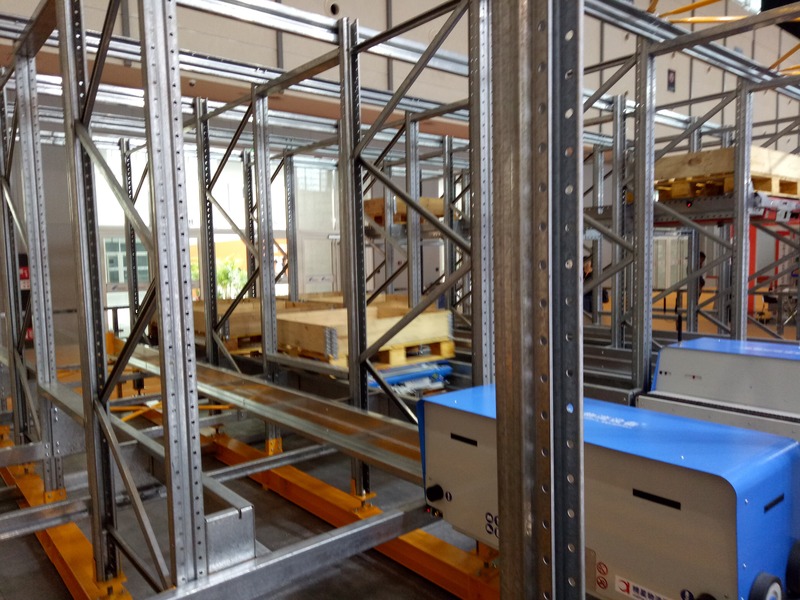 LogiMAT puts the logistics inside a factory or warehouse into the center of its attention, but is different in one more aspect: a large percentage of the exhibitions supported aspects of automation and self-organization, i.e., the trending topic of intelligent storage and logistics systems. 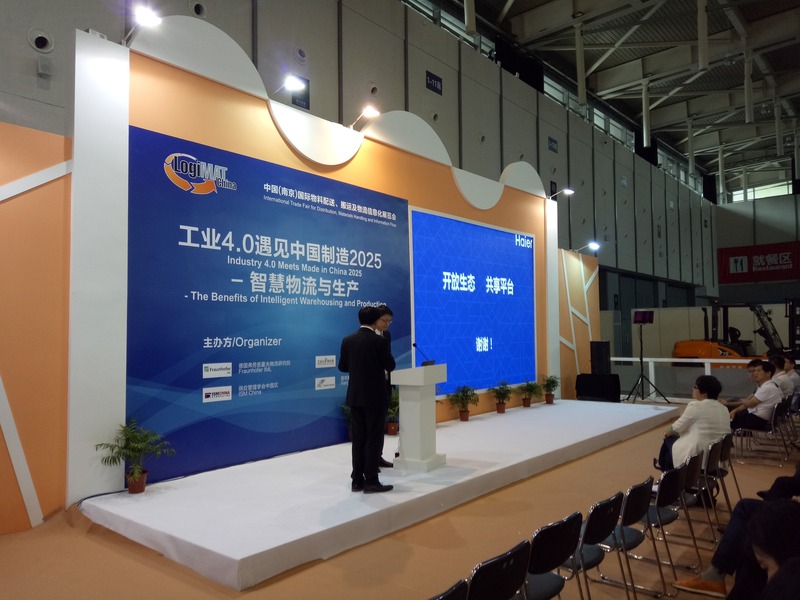 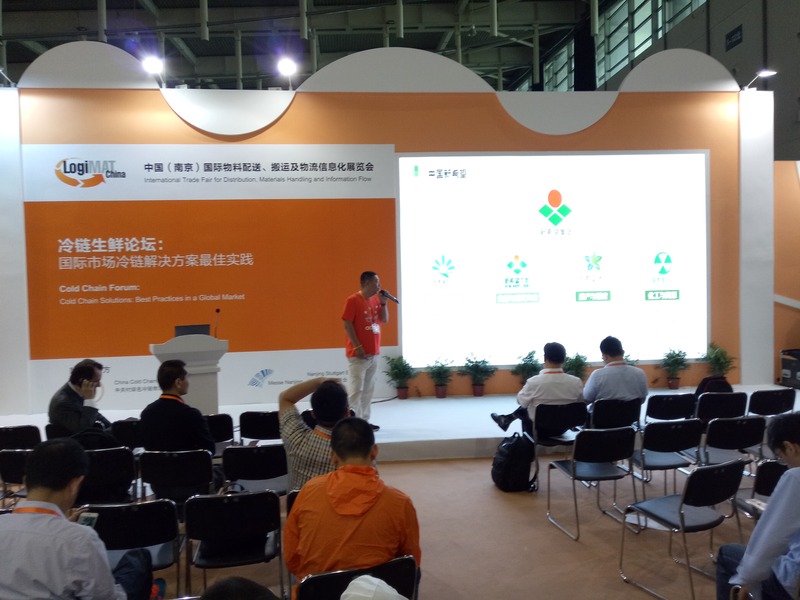 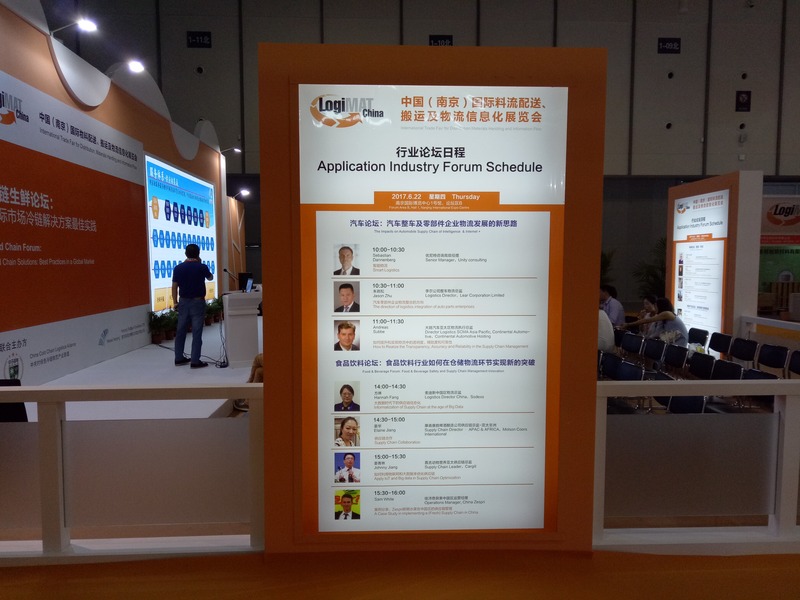 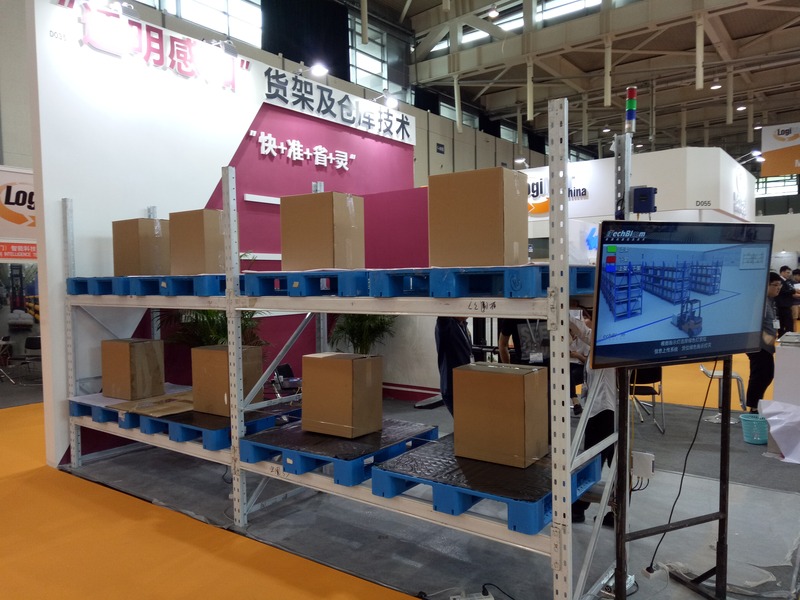 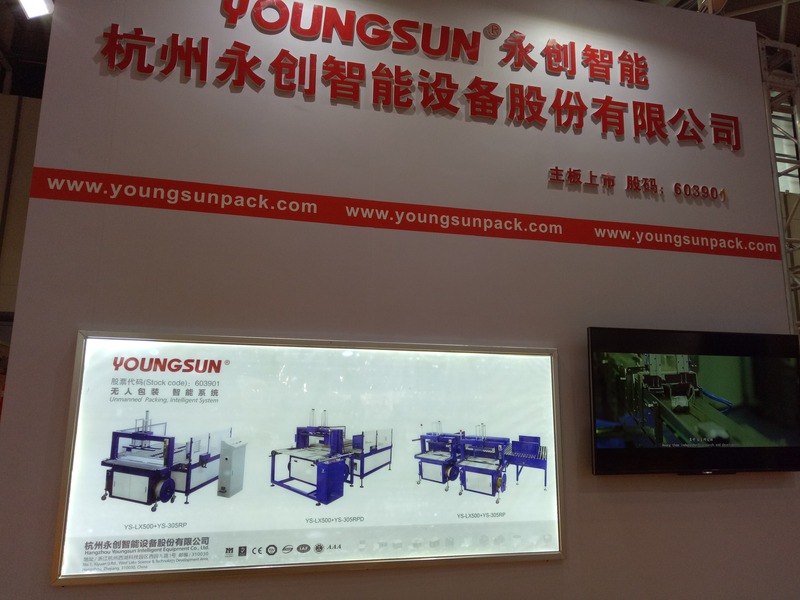 This is emphasized with forums such as "Industry 4.0 Meets Made in China 2025 – The Benefits of Intelligent Warehousing and Production." 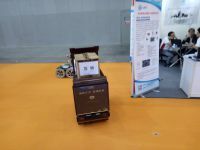 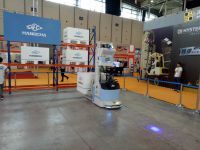 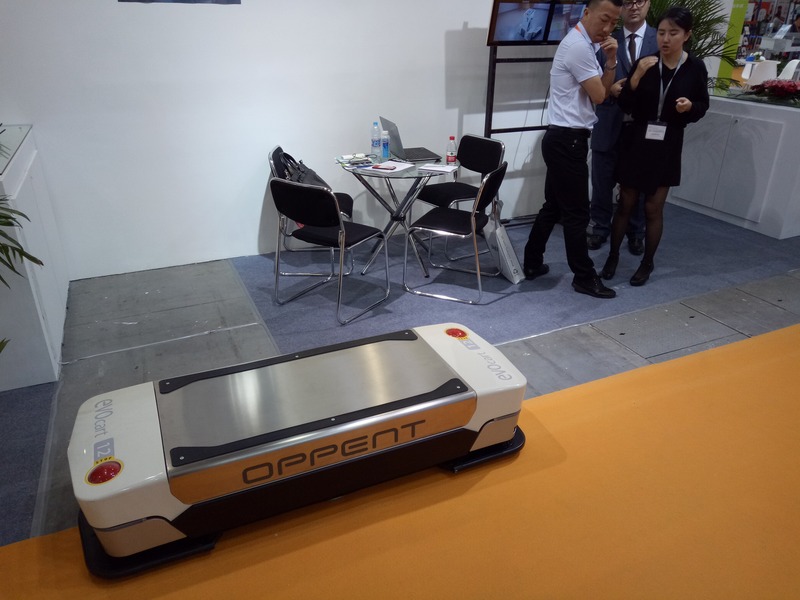 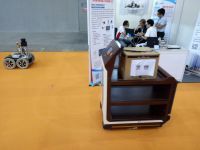 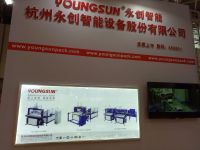 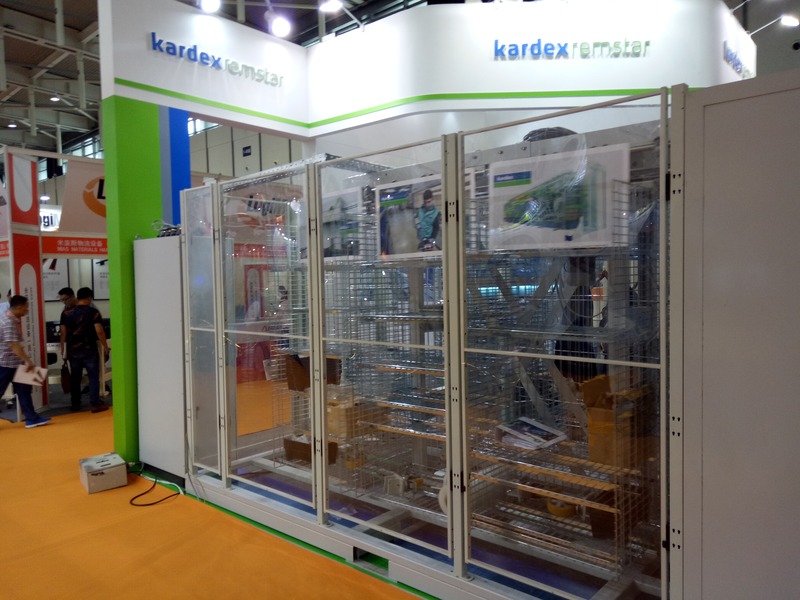 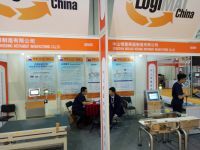 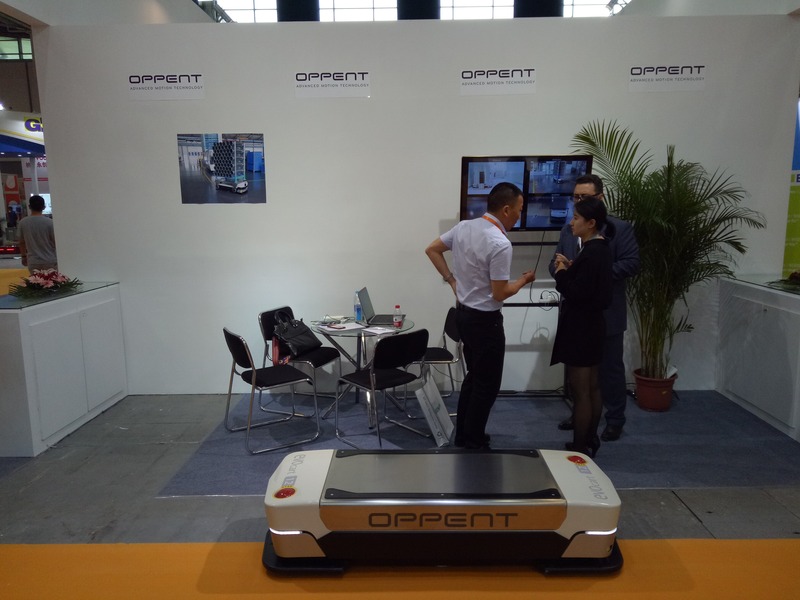 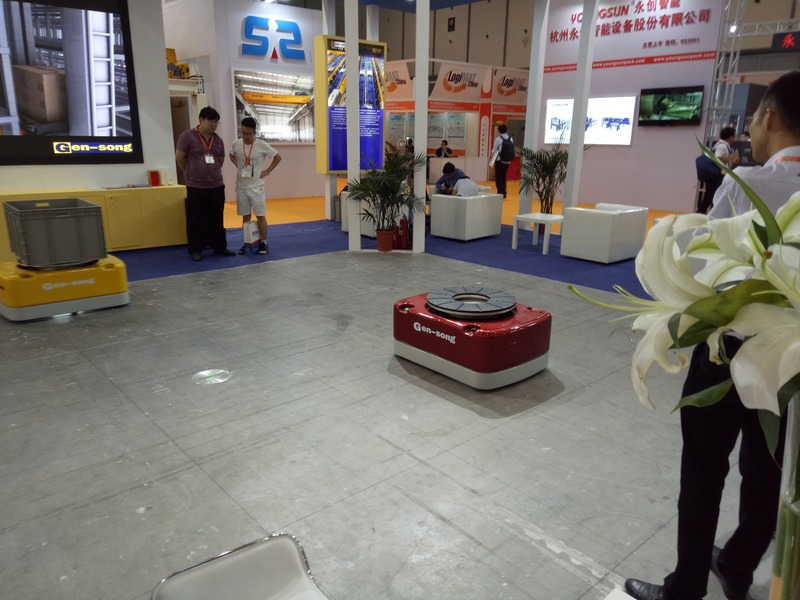 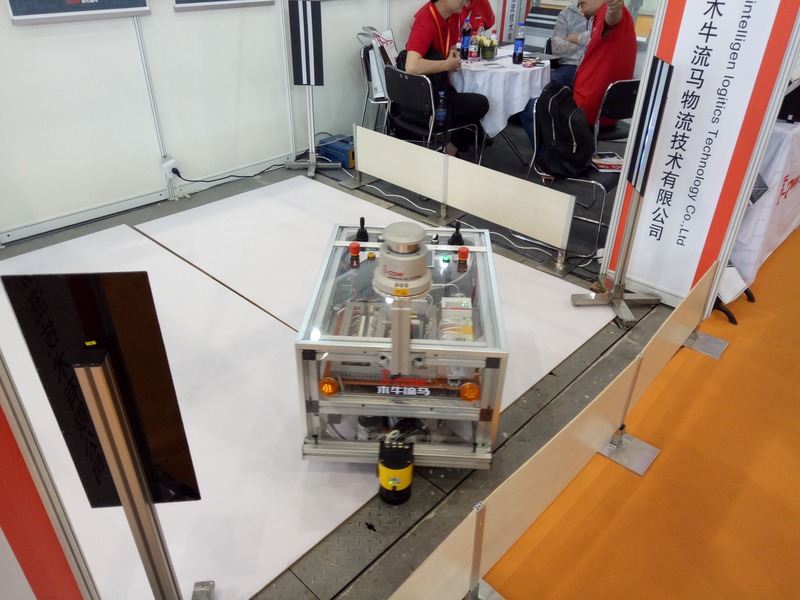 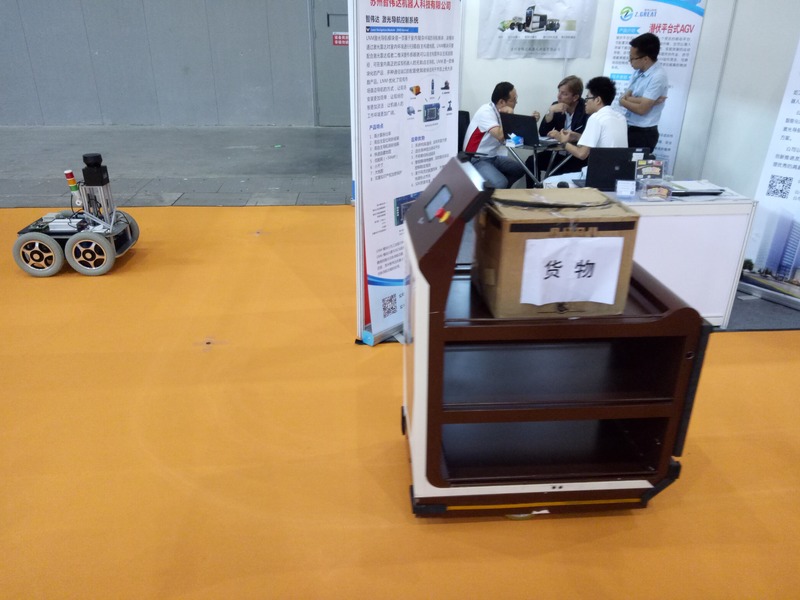 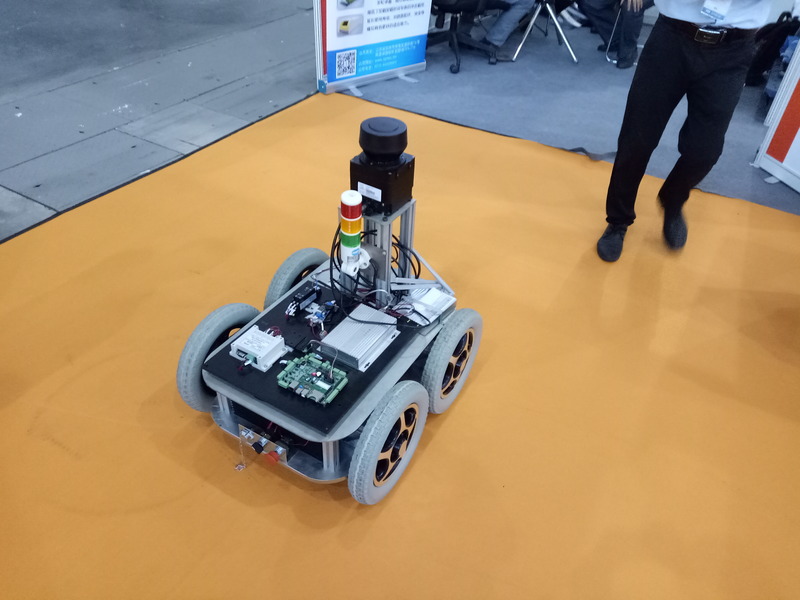 Several producers of Automated Guided Vehicles (AGVs) were present. 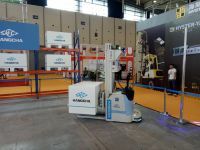 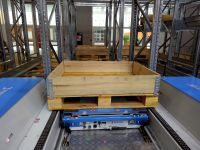 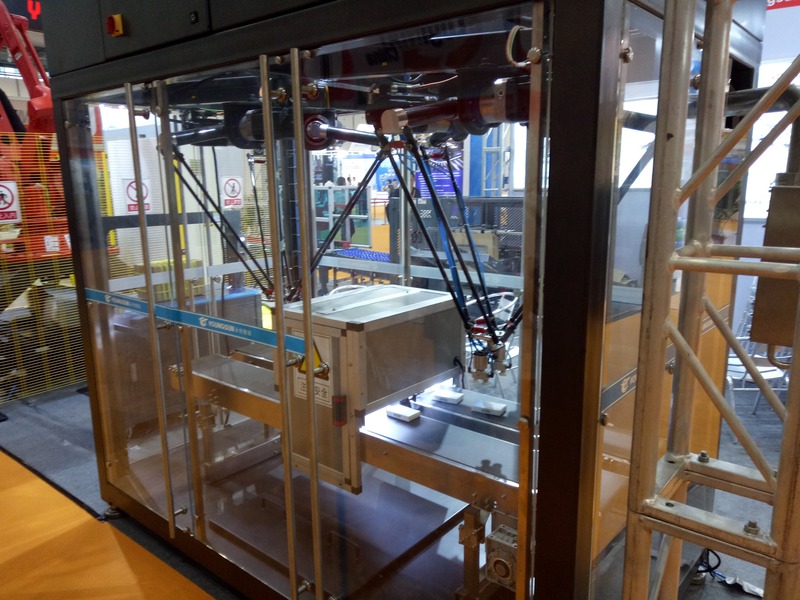 AGVs are robotic, self-driving vehicles used for, e.g., transporting materials inside a factory. 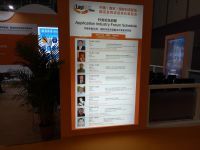 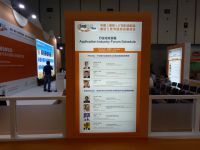 There were several impressive exhibits on the topic, which demonstrated the newest advances of the field. 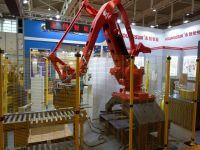 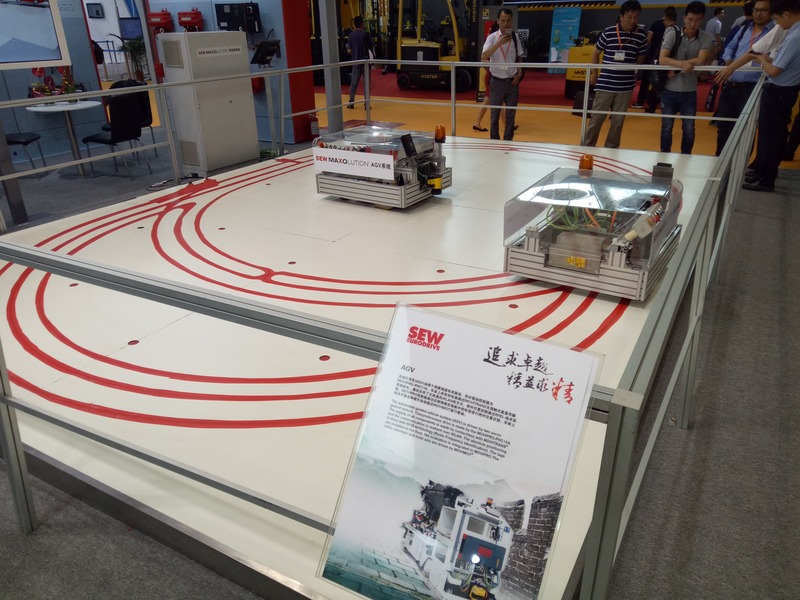 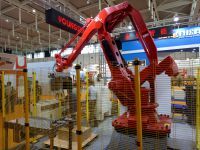 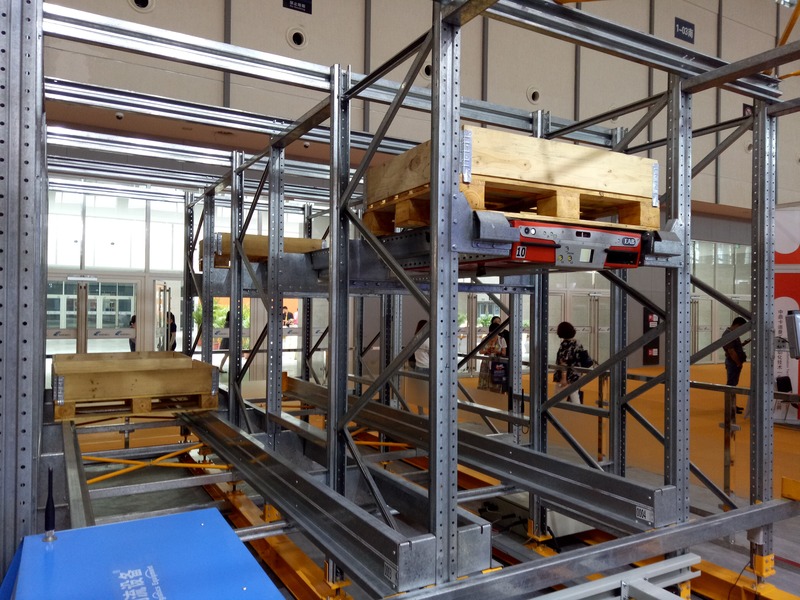 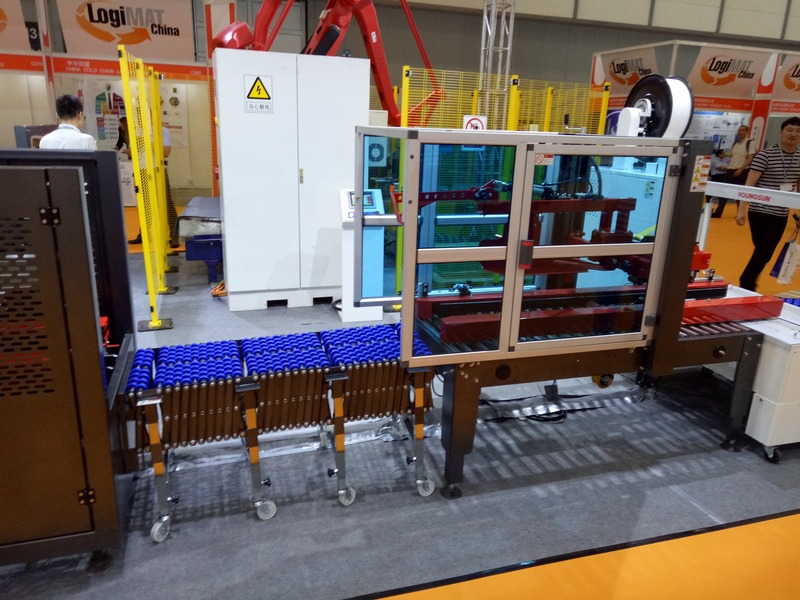 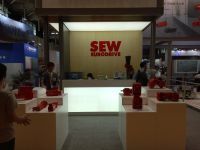 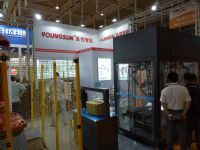 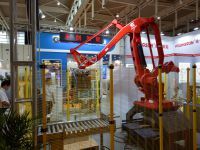 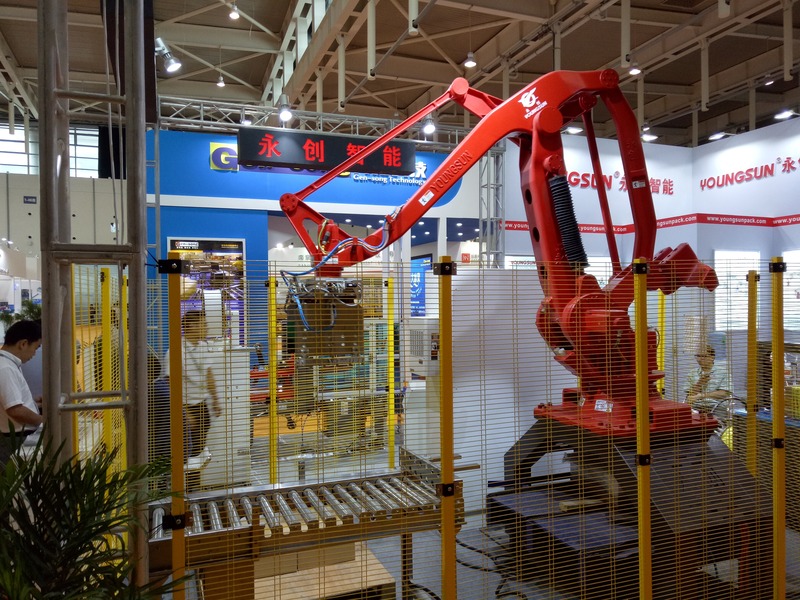 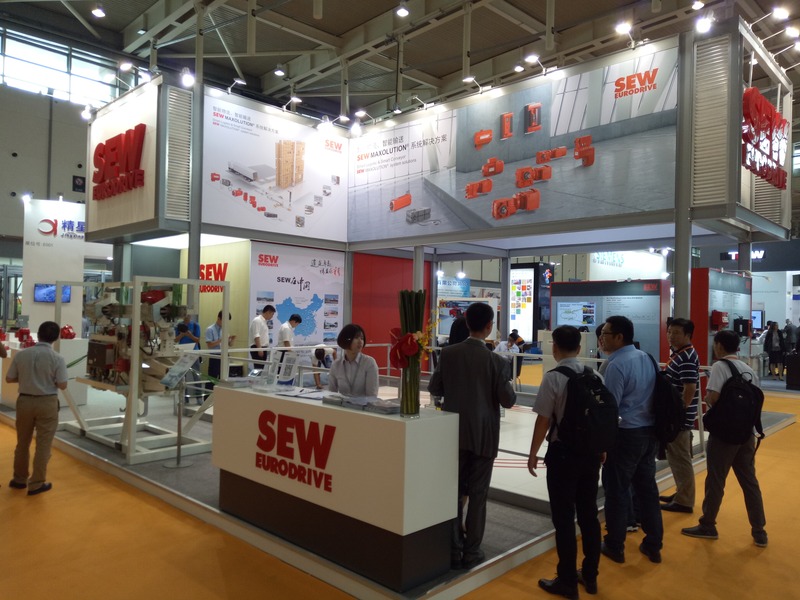 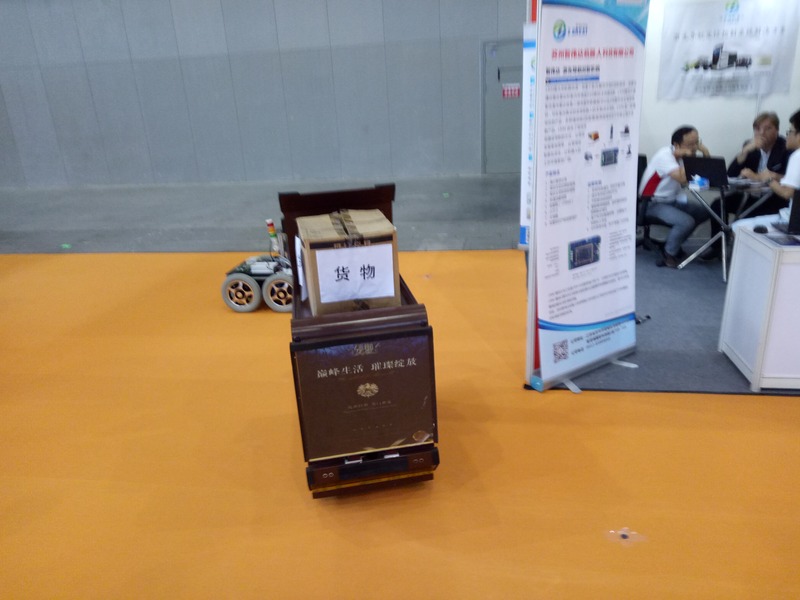 But there were also several exhibits showcasing automated storage systems, conveyor belts, and even self-driving fork lifts. From the science perspective, many of these products can be described as single or systems of autonomous, intelligent agents. 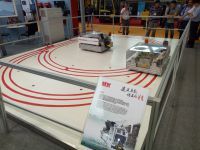 It can clearly be seen that the future of material transportation inside a factory will be automated, not manual. My colleagues Prof. Schüller and Dr. Gösling are already working on this topic and launched a Logistics 4.0 laboratory at our Hefei University. 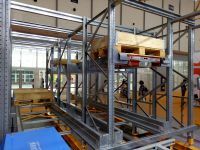 My old group at the University of Kassel also does research on several interesting projects related to this field. I think in my posts on the previous three exhibits I already pointed out that logistics for a highly-automated industry will need a strong IT for its management. 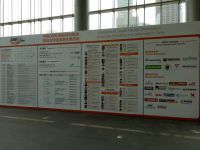 On one hand, there always needs to be at least some central database keeping track of what is done or what is where. 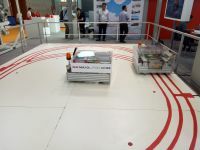 On the other hand, this holds even more in scenarios where large parts of the infrastructure run automatically, by themselves, without active human control. 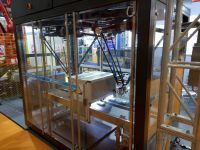 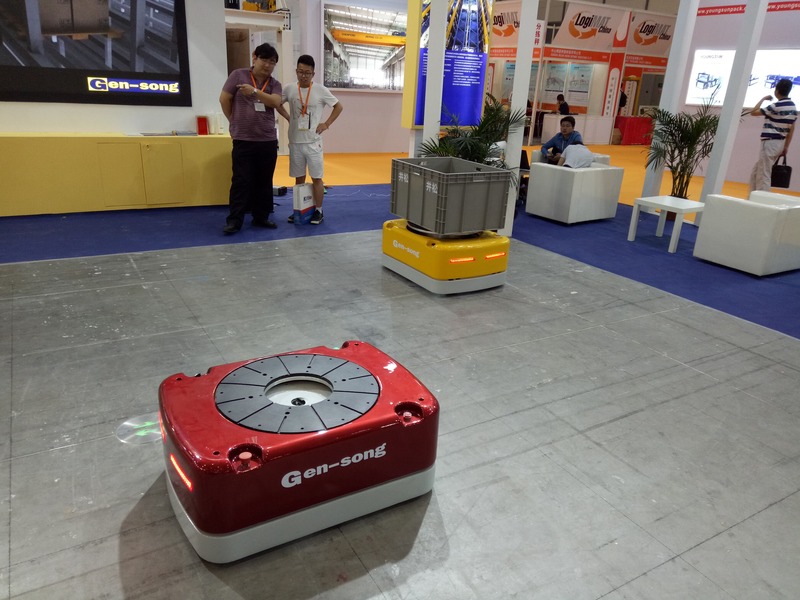 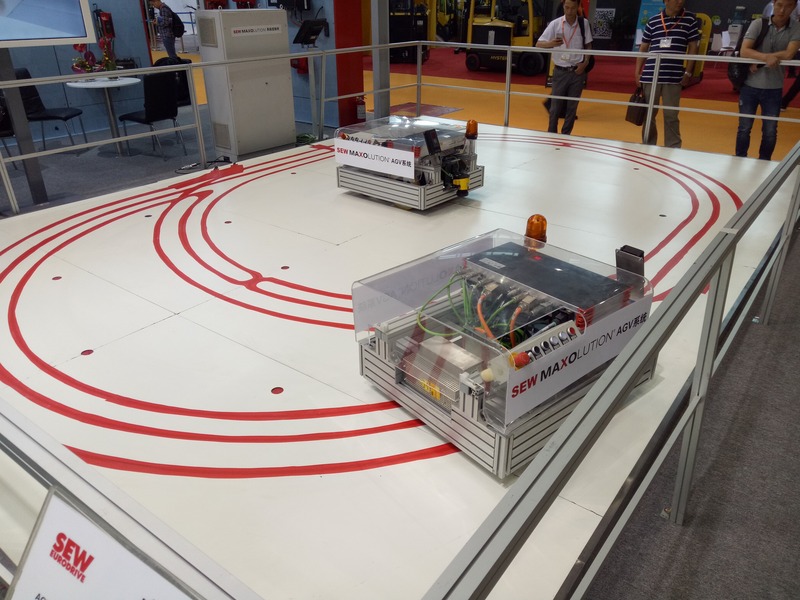 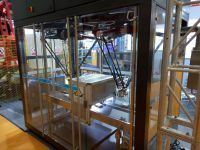 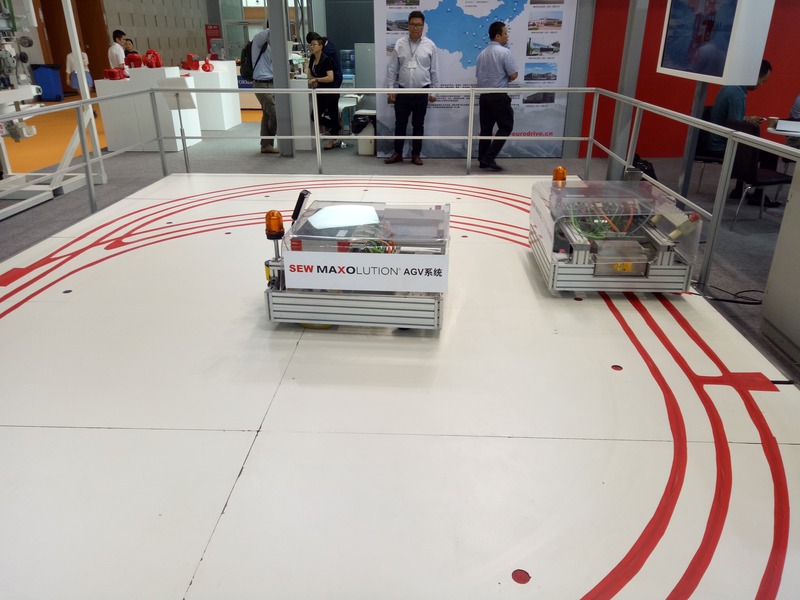 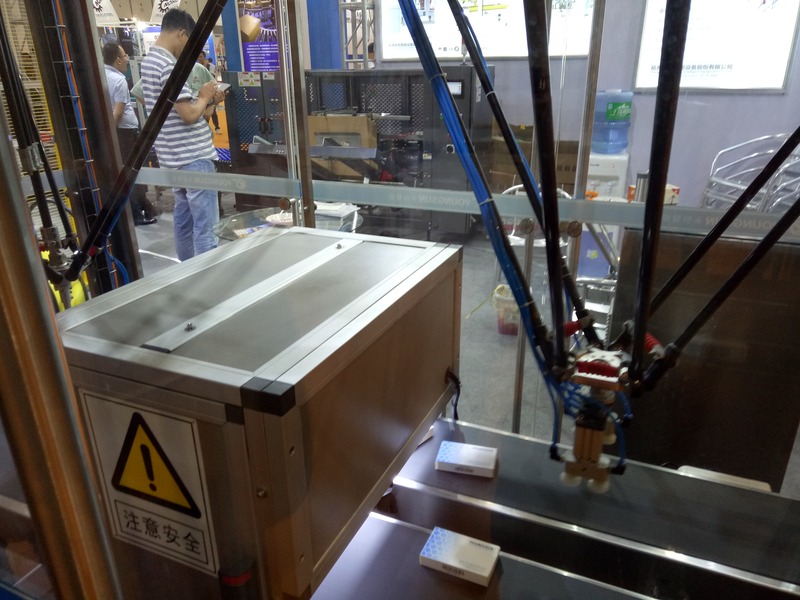 If AGVs drive around autonomously, they either need to plan their work by themselves or receive guidance from a central planning algorithm – and planning here means to do optimization, either in form of simple heuristics or more complex algorithms. 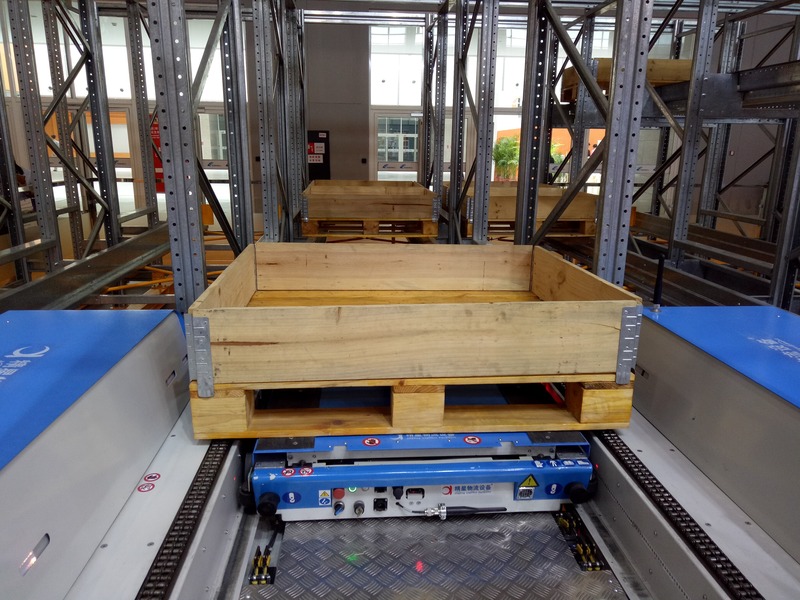 With the ever-growing amount of goods, products, parcels, and raw material to be transported, inside or outside of and between factories, the question on how to do (plan) this efficiently is both of economical and ecological interest. Operations research for "Logistics 4.0" poses problems with complex constraints, non-linear, dynamic, and online characteristics. 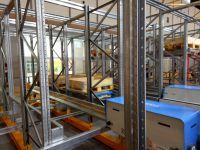 Furthermore, logistics are rarely decoupled from the rest of an enterprises operation. 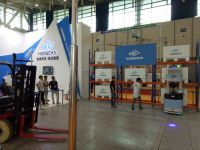 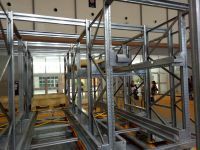 Instead they are intertwined with the supply chain management, the warehousing, and the production planning on the factory floor. 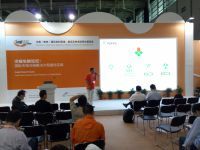 Our institute can contribute applied research on all of these fields, which is documented with publications in several top-level journals in the field of optimization.